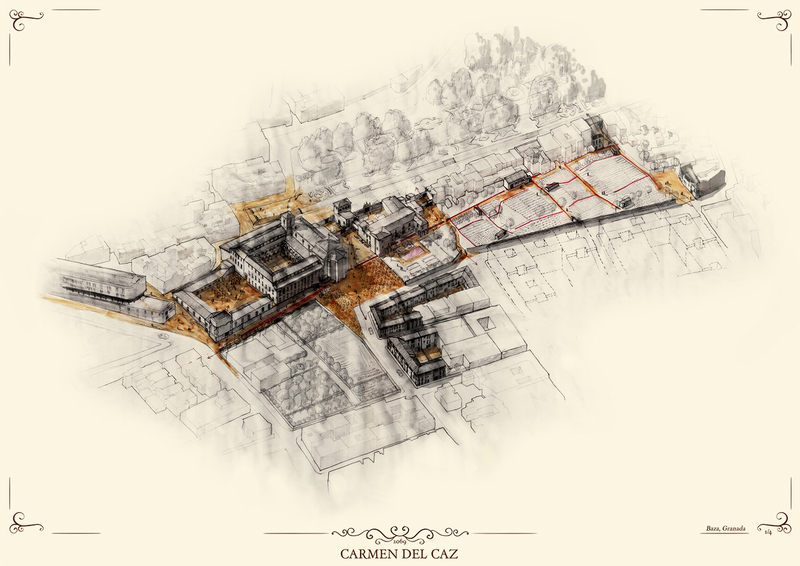 The proposal set to develop an intervention in Baza searched to re-boost and dignify the monumental area located on the southern side of the Medina on the course of the Caz Mayor, an important channel which has historically irrigated the orchards within the area of Baza. 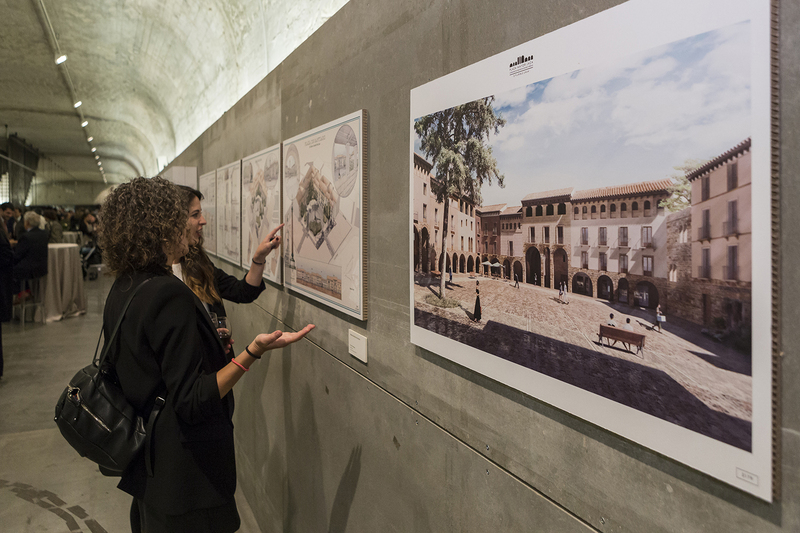 It consisted of giving the citizenship not only a new network of public spaces, but also, retrieving heritage, in a place where historical, architectural, ethnological, archaeological and environmental values come together. 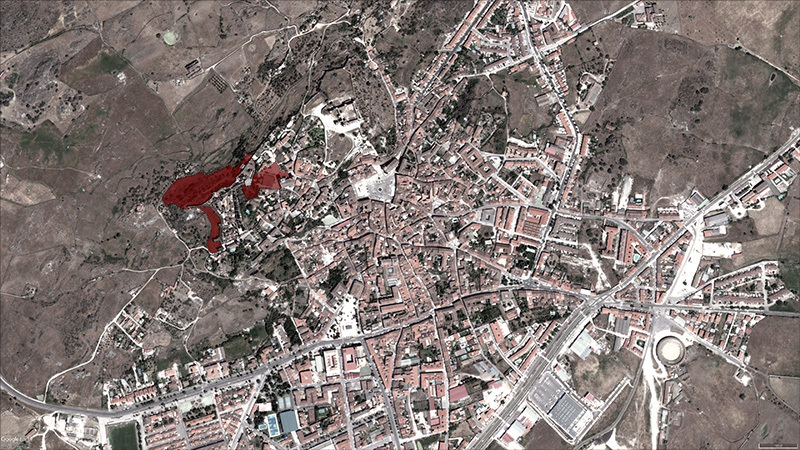 An area which, today, is sadly abandoned. 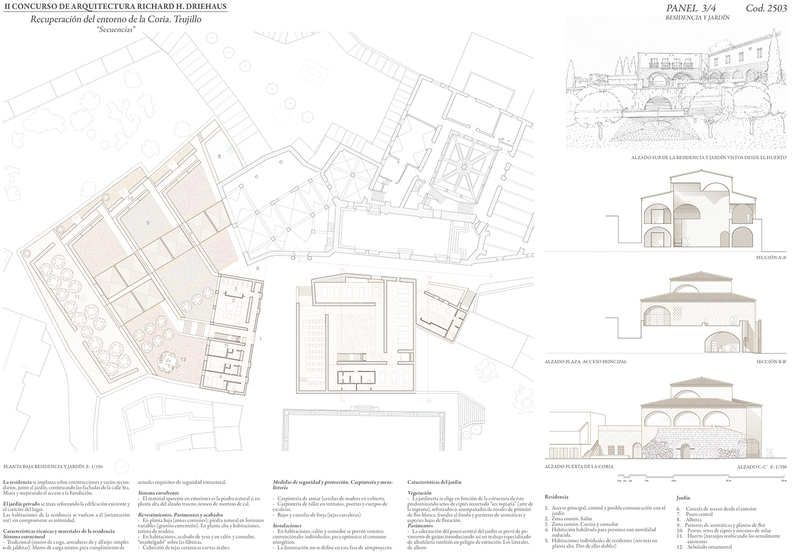 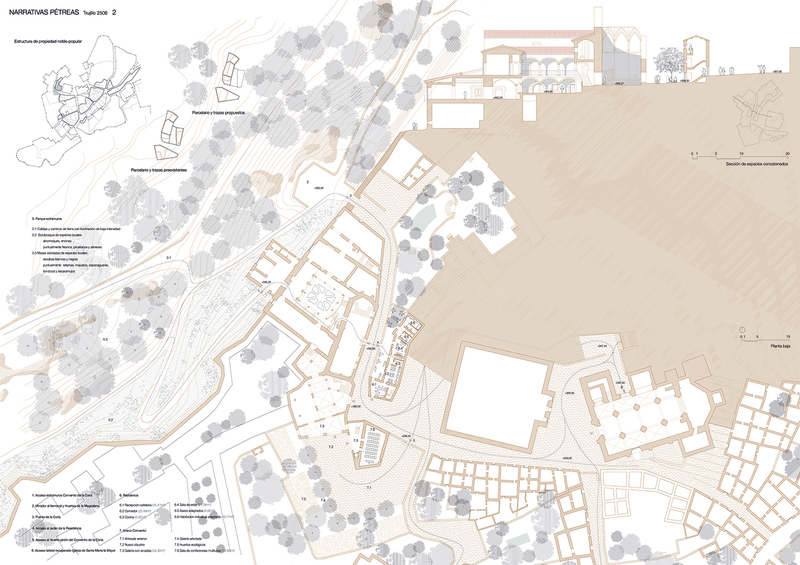 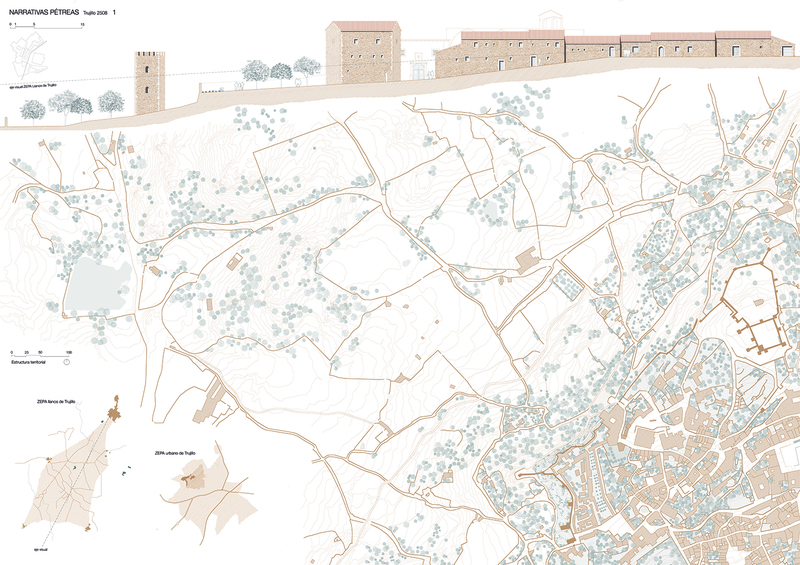 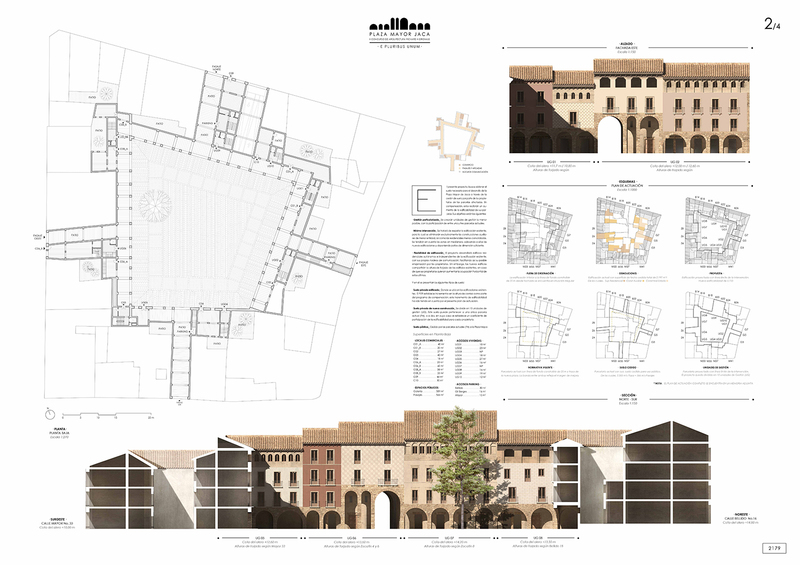 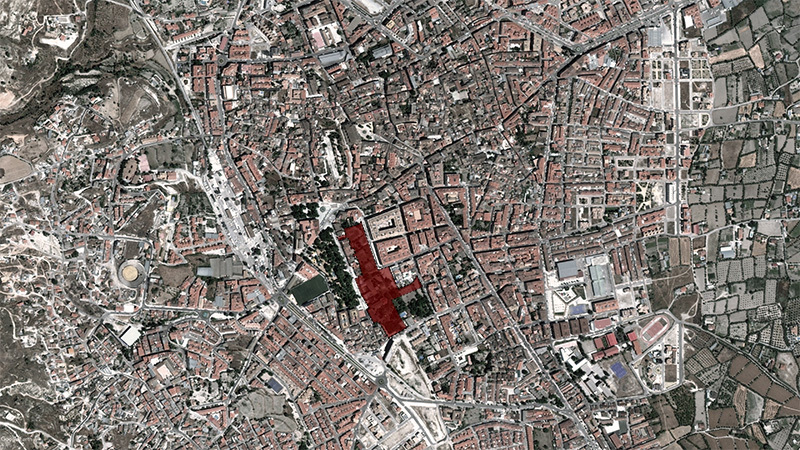 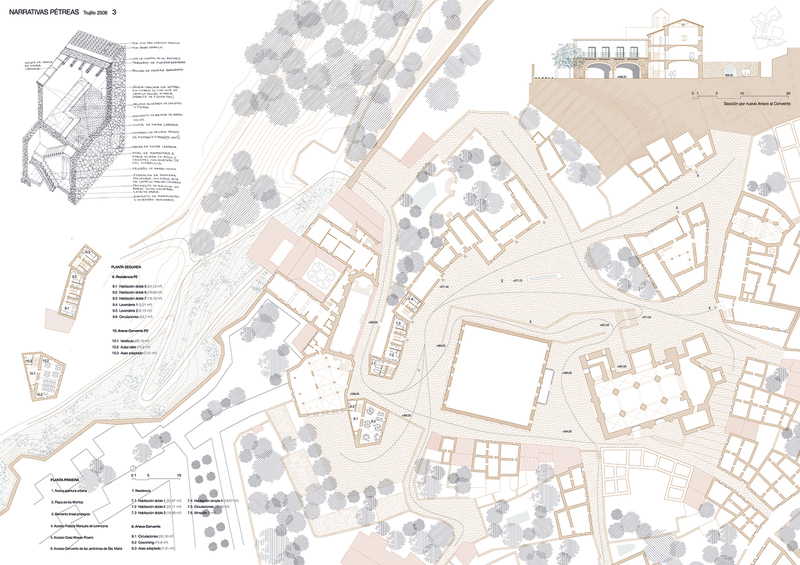 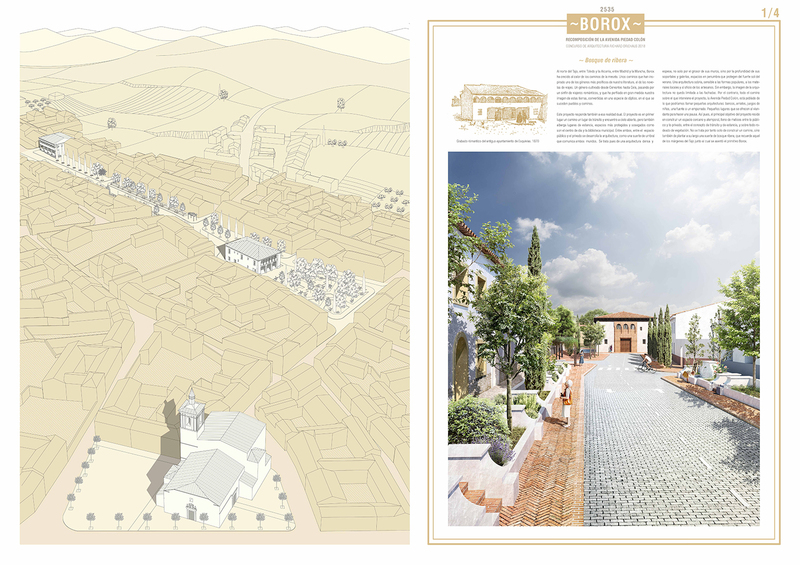 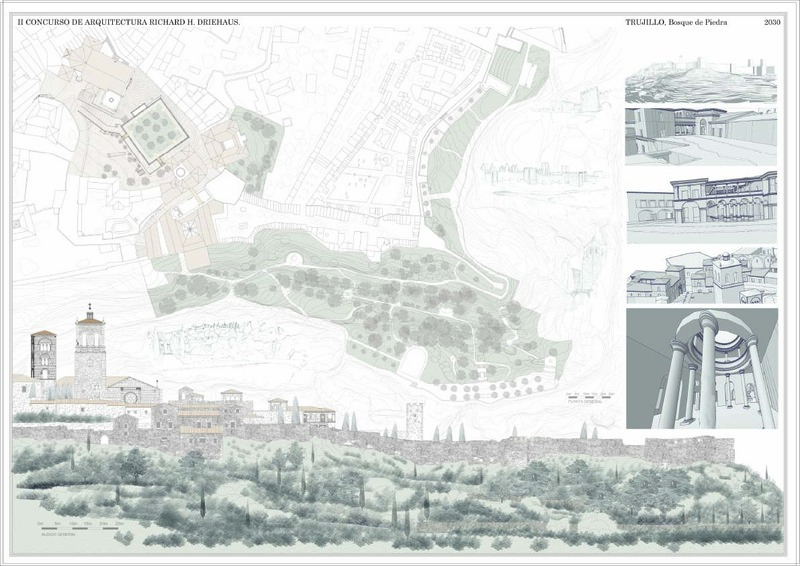 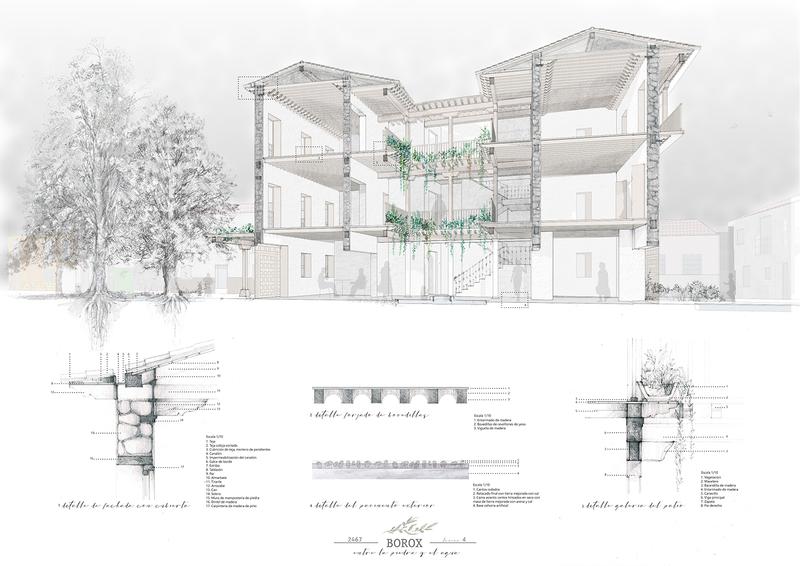 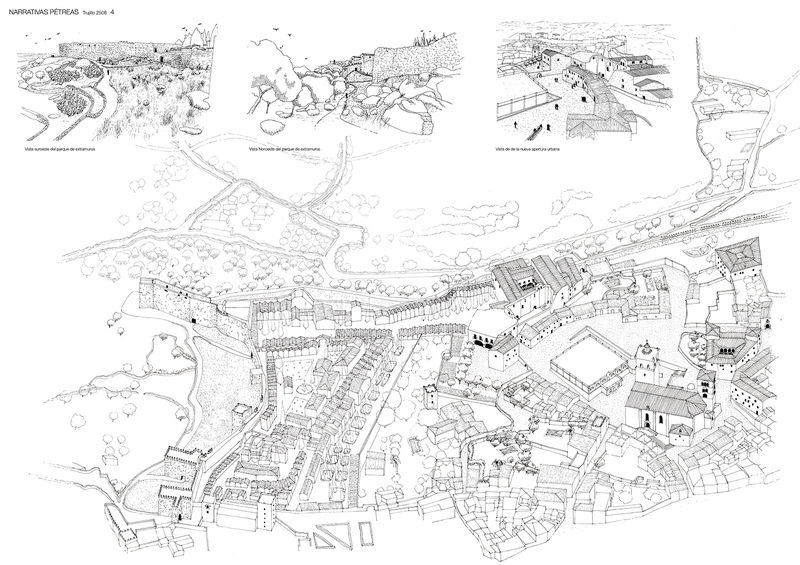 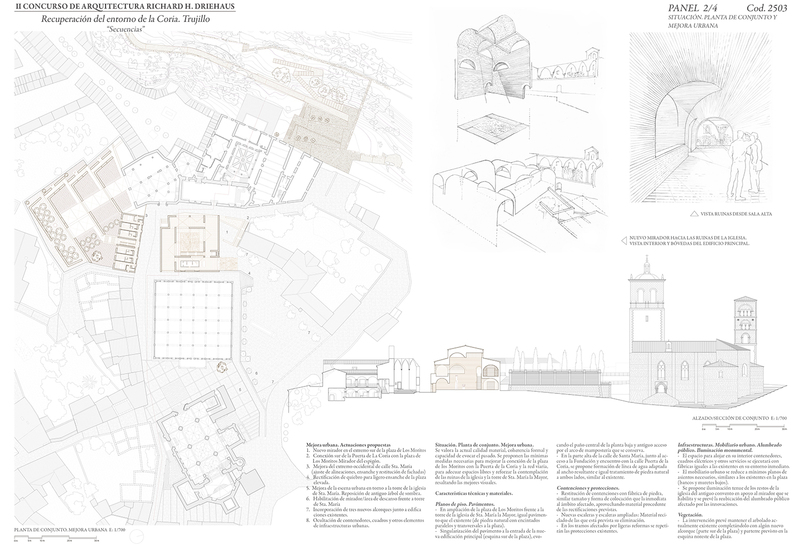 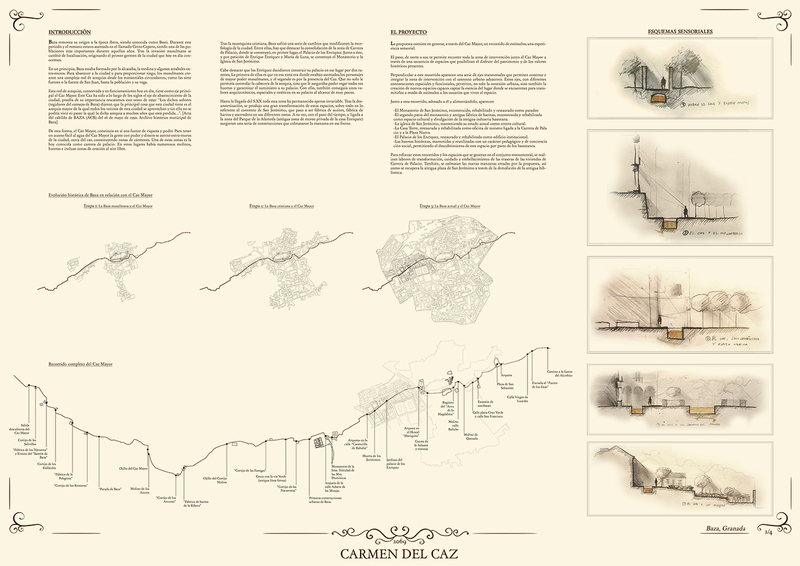 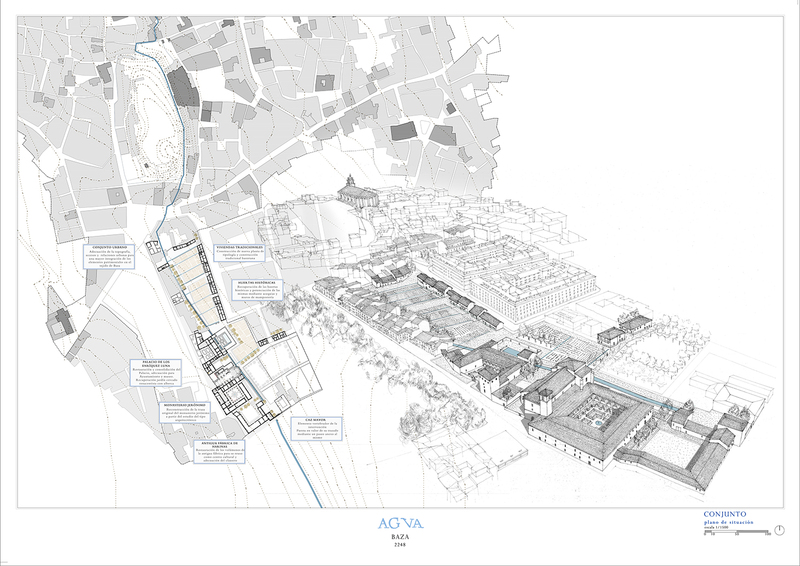 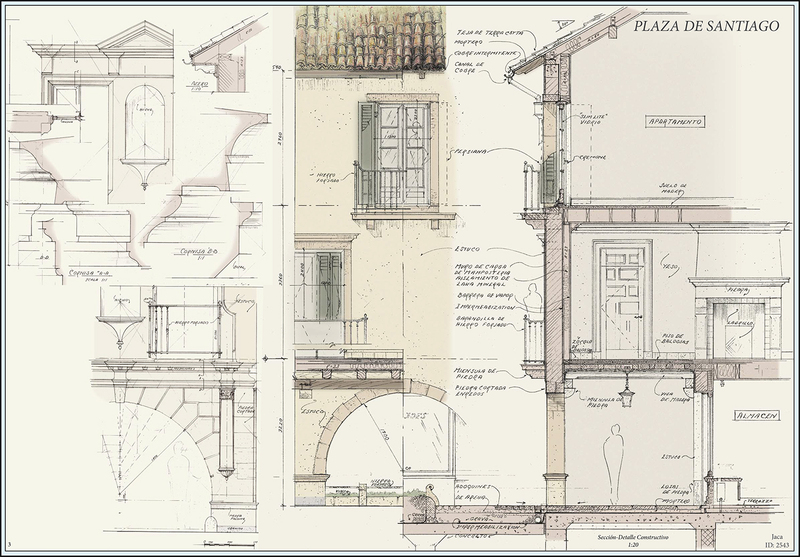 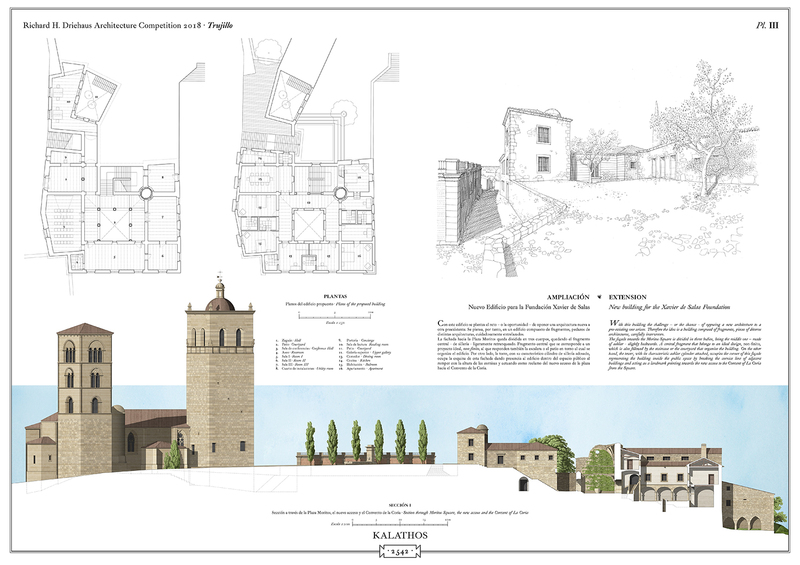 The winning proposal, awarded with 12.000€, has been the one developed by the team of architects composed by Estefania Fernandez-Cid Fernández-Viña, Xavier Espinos Bermejo, Lucia Espinos Bermejo, and Rodrigo Toro Sanchez, who, last year, had already obtained an honourable mention for their project for Grajal de Campos. 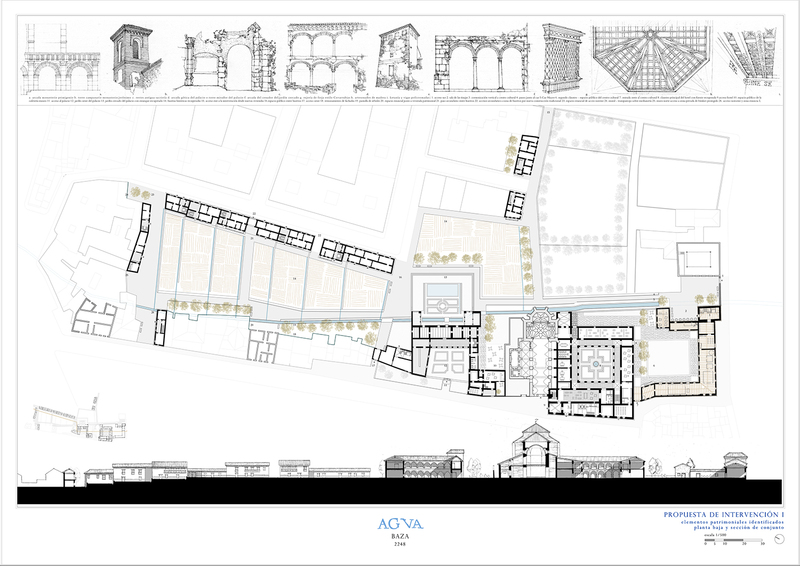 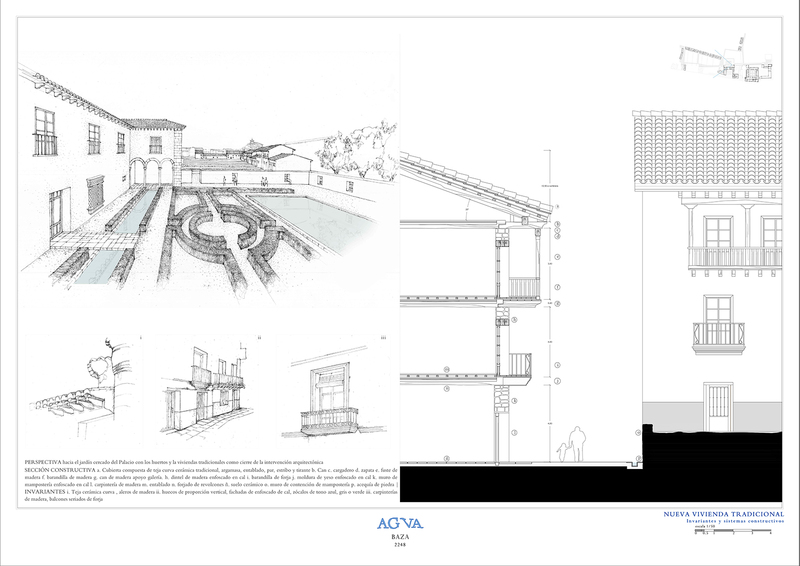 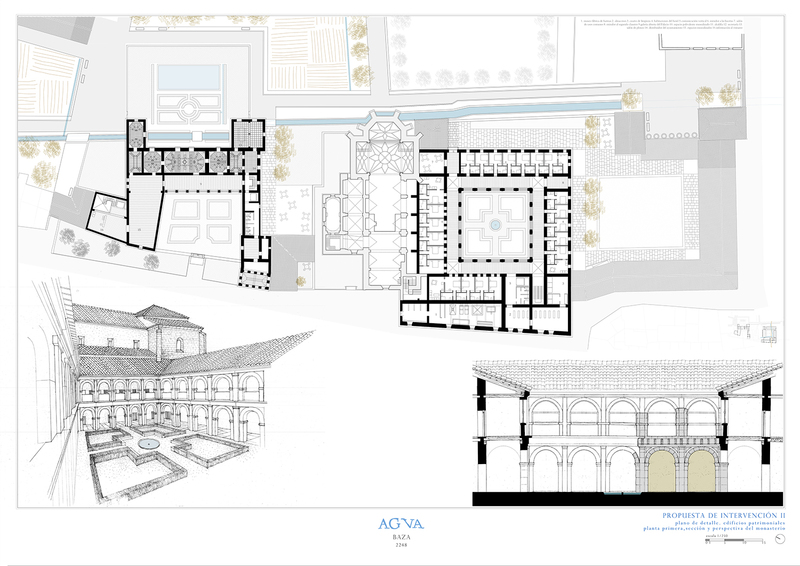 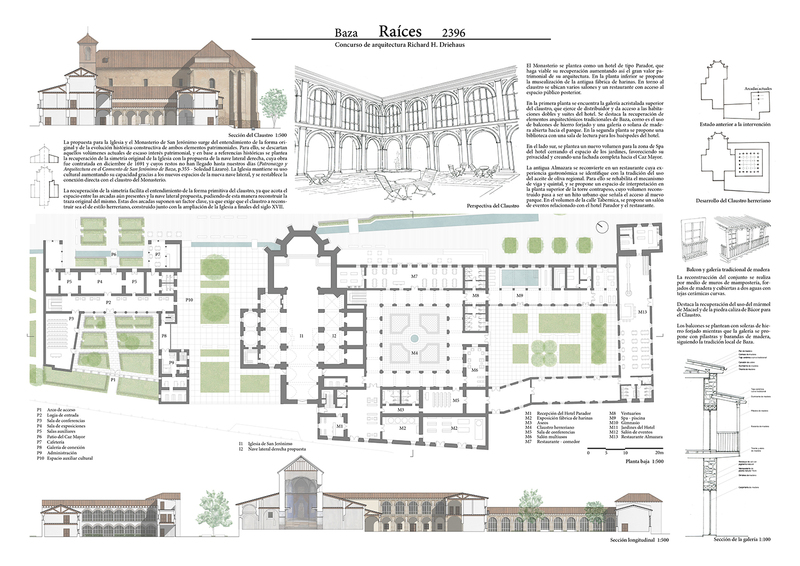 Their Project titled “Agua” (Water) suggests reconstructing the cloister of the convent, rehabilitating it for hotel use, and retrieving the palace and its gardens, including the old monumental water element which presided them and supplied them with water. 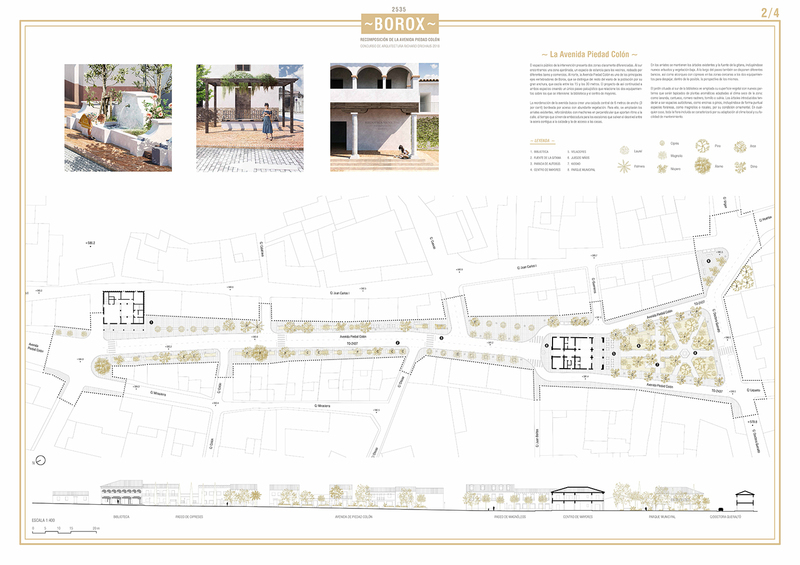 The proposal also includes a new image for the surrounding streets, building at the end of the pre-existing orchards, constructions which are more adequate considering the city’s identity. 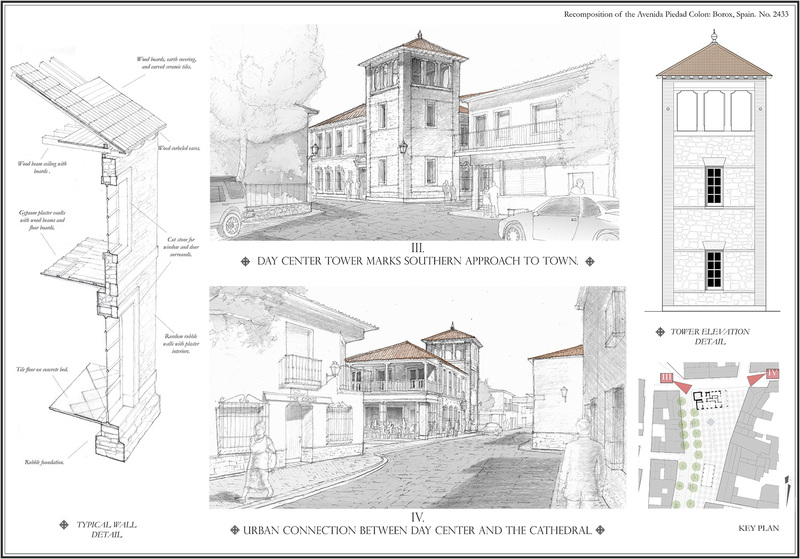 This way, the disproportionate blocks of housing erected during the last decades are left to remain in the background, and therefore a more adequate architecture for this historic context is designed and made prominent. 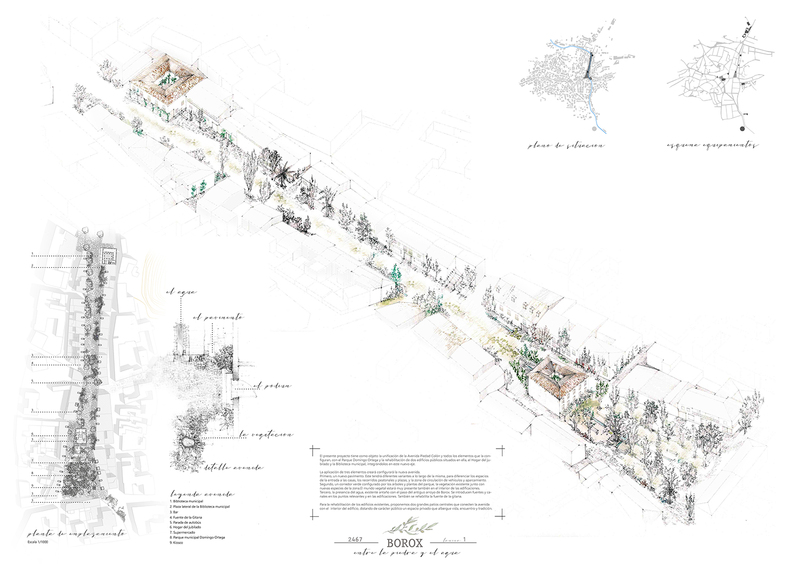 It is all designed supported by the natural resource of water, materialized in the Caz Mayor stream and the irrigation ditches of the orchards around which, a pleasant promenade is developed. 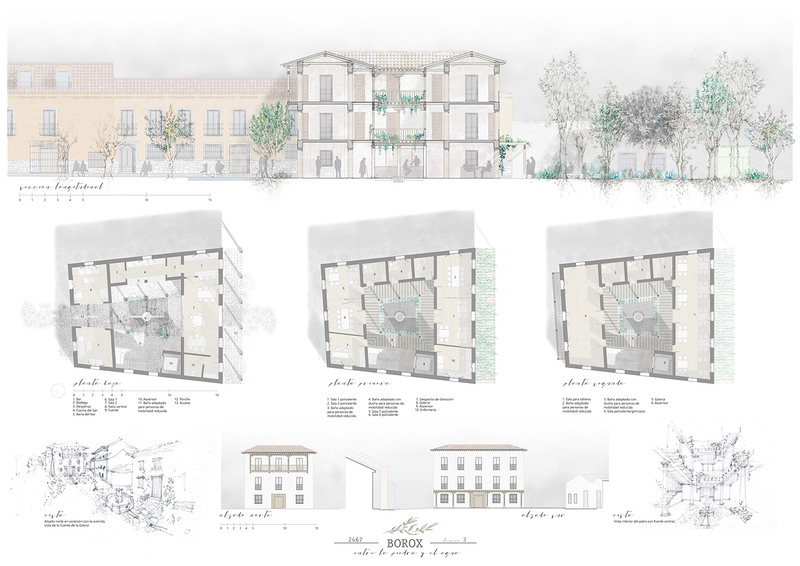 Due to the high quality of the rest of the proposals, the jury also awarded three honourable mentions, 2.000€-worth each. 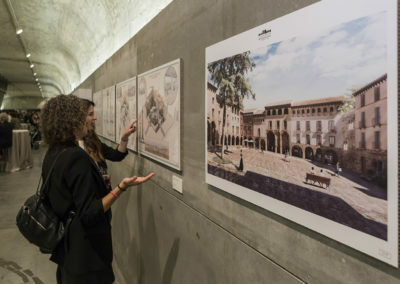 The three projects, all of which of great beauty, also aimed to retrieve the place’s memory, returning its values to the heritage of the area, keeping alive the footprint of its history. 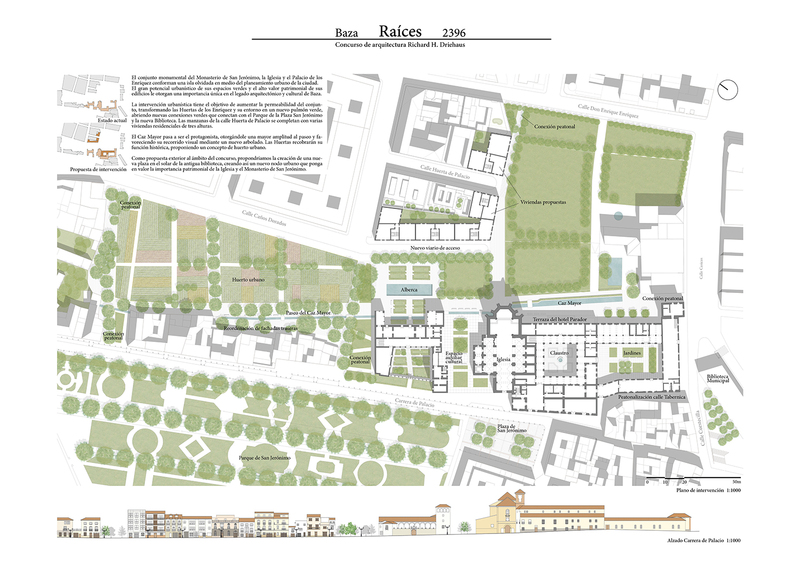 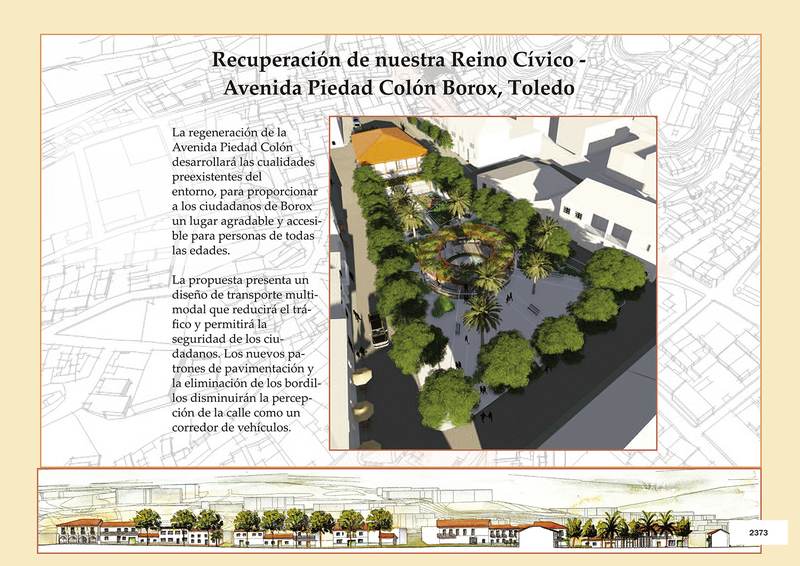 Borox put forward the proposal to equip with a new design one of the main axis on which the urban city centre is developed -the Piedad Colon Avenue-, as well as two main public buildings which surround it: The Senior Citizens’ Social Club and the Municipal Library. 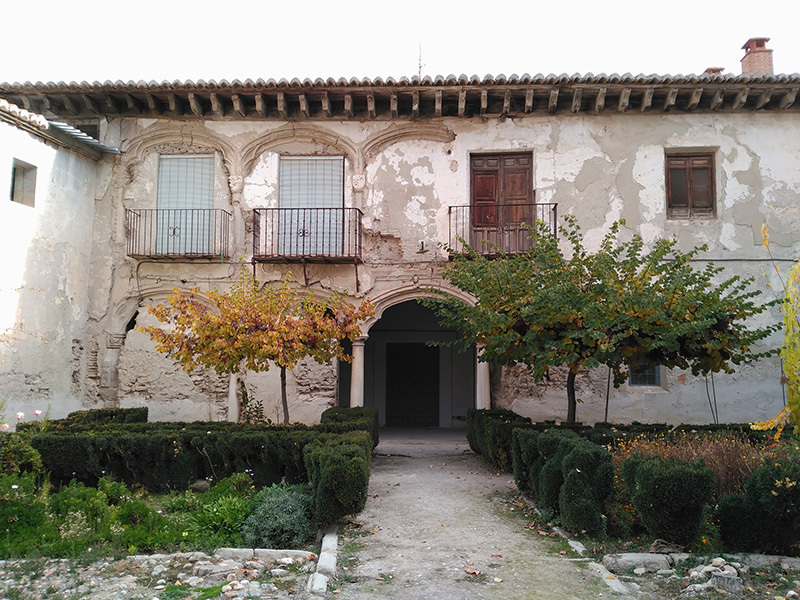 Two buildings which currently present an image which distorts the attractive traditional character of the place and that, after having suffered a series of successive transformation, fail to adequately comply with demands of the citizens’ needs. 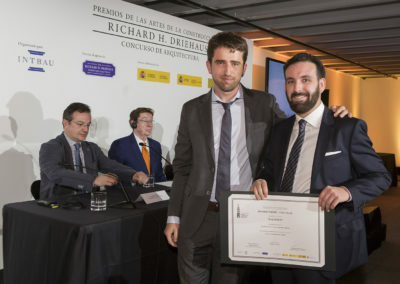 The jury decided to award the first prize, totalling 12.000€, to the north-American team composed by Patrick Alles, Matthew Blumenthal and Megan Zhang because of their proposal being the one which best solved the needs of the area at an urban scale. 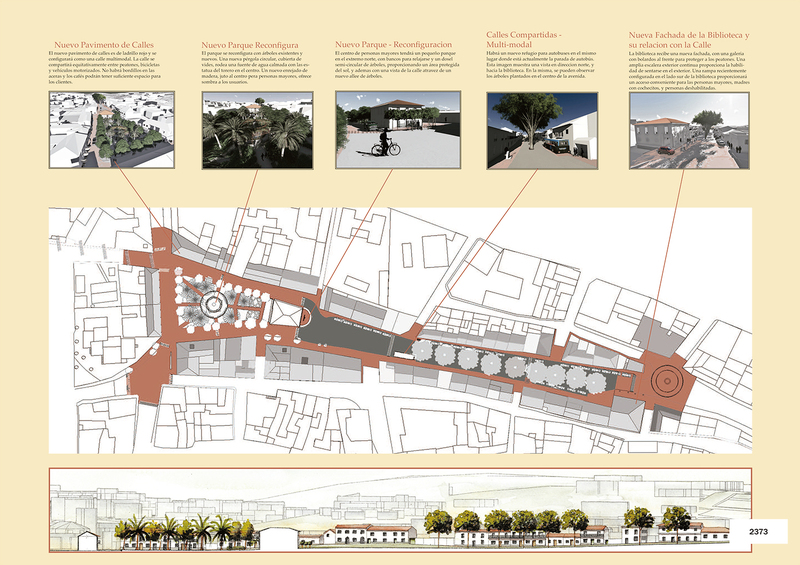 They relocated the new day centre at the end of the avenue, increasing the pre-existing green area, creating a new open and covered public space in the middle of the new park generating a better visual connection with the different landmarks and unique areas of the town. 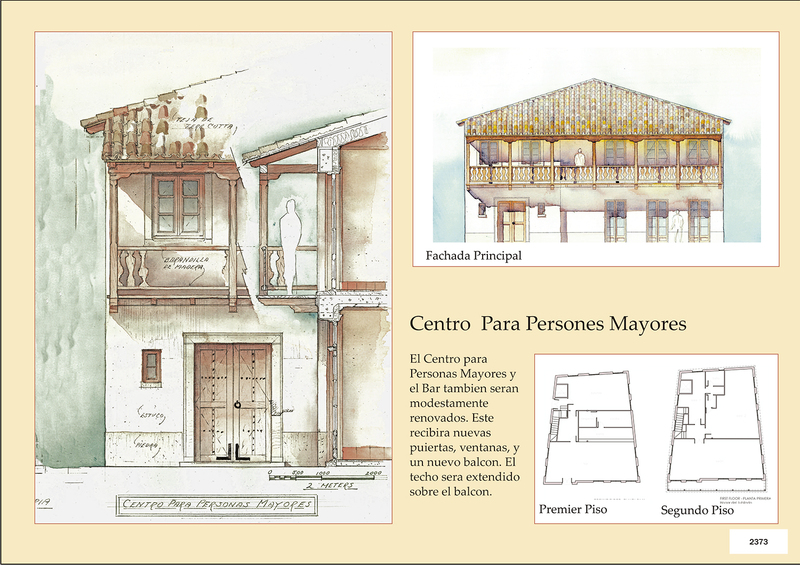 At the same time they also included new buildings drawing on the traditional architecture of the place. 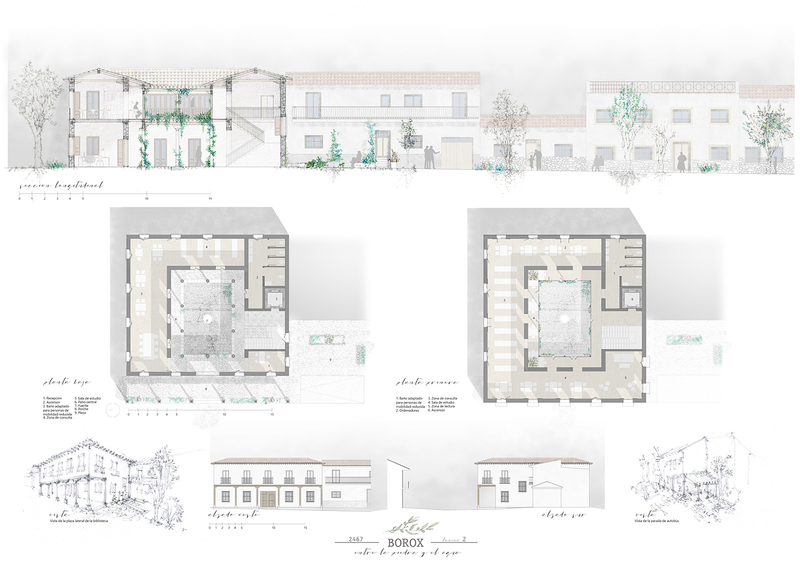 The jury also awarded three honourable mentions, 2.000€-worth each. 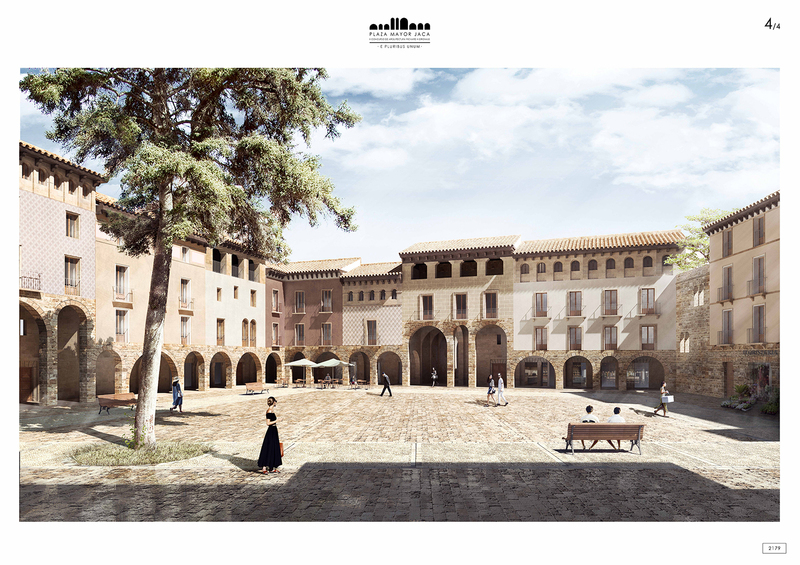 These three projects also suggested developing proposals which were very attractive and sensitive in terms of taking into account traditional shapes, local materials and the work of the artisans in the area. 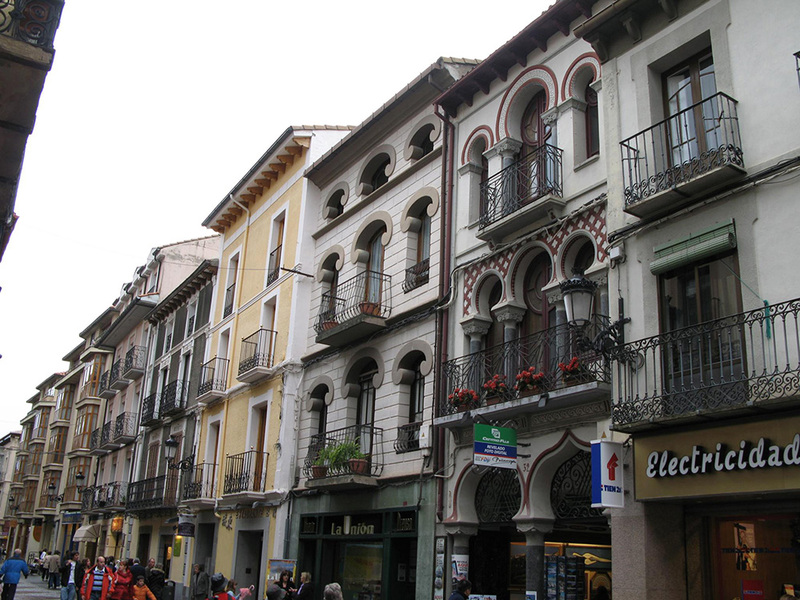 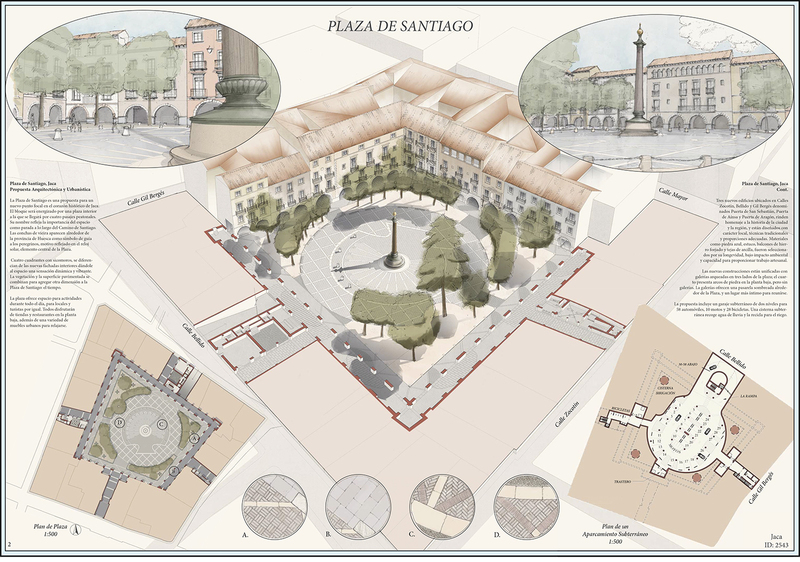 In Jaca, the Town Council wanted to develop the transformation of the inside of a whole square within its historic centre in order to create a unique public space in the heart of the city. 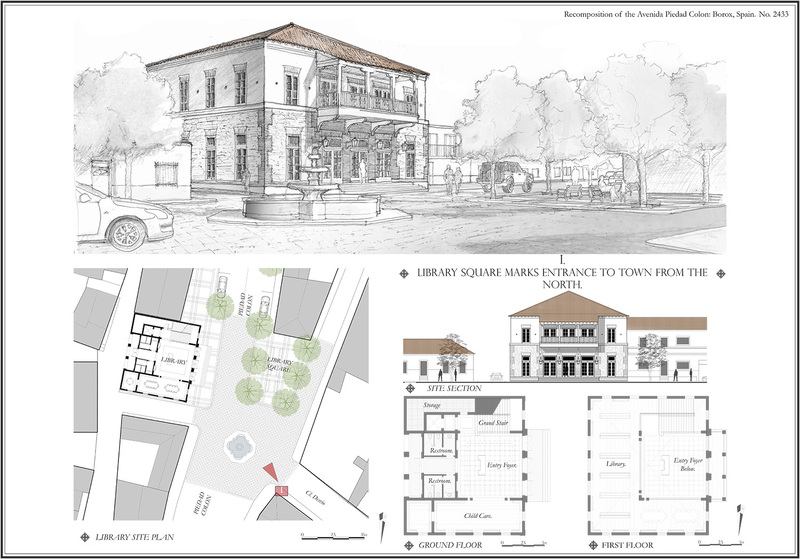 This new square could therefore contribute to its revitalization, broadening this way, the pre-existing network of pedestrian public spaces with the large public space that this area required. 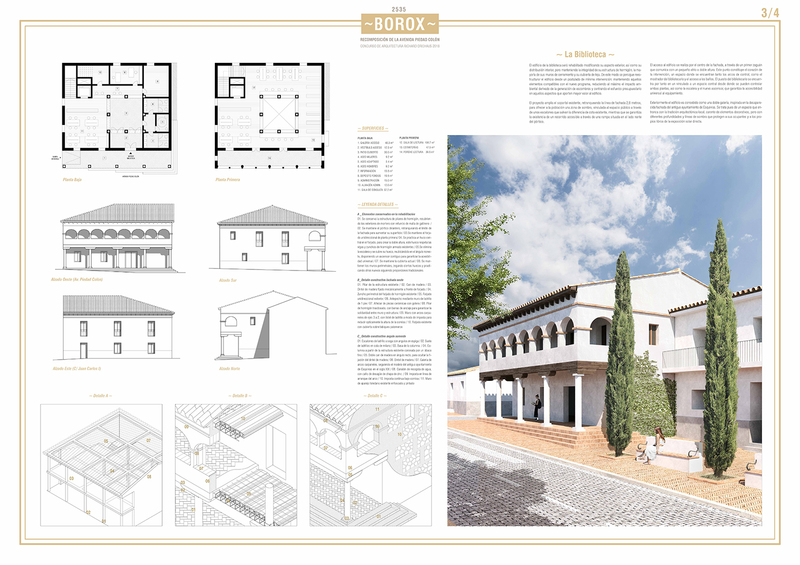 The jury has decided to award the first prize, totalling 12.000€, to the proposal titled “Pluribus Unum”, designed by the architects from Seville Abelardo Linares del Castillo-Valero and Elena Jimenez Sanchez, who were also awarded an honourable mention for their proposal for Borox. 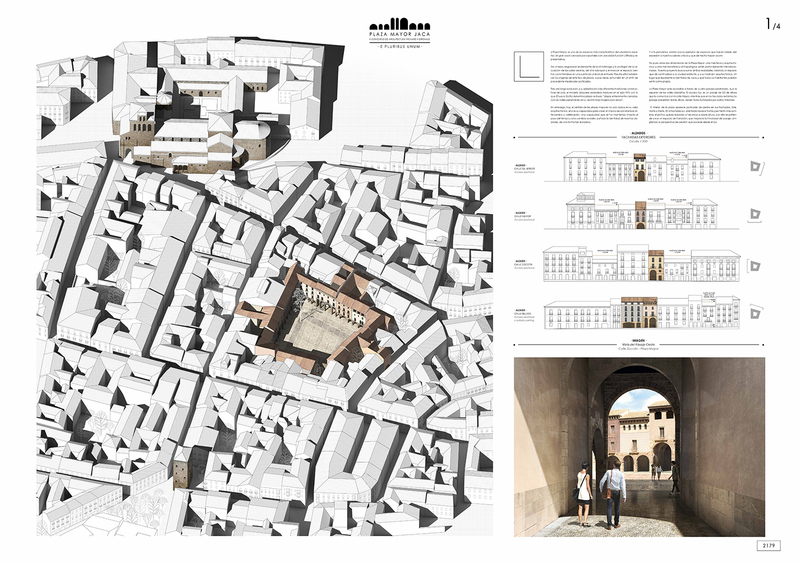 Their design suggests a new civil area characterized by its life and diversity, compiling the architectural heritage which has defined the nature of the city. 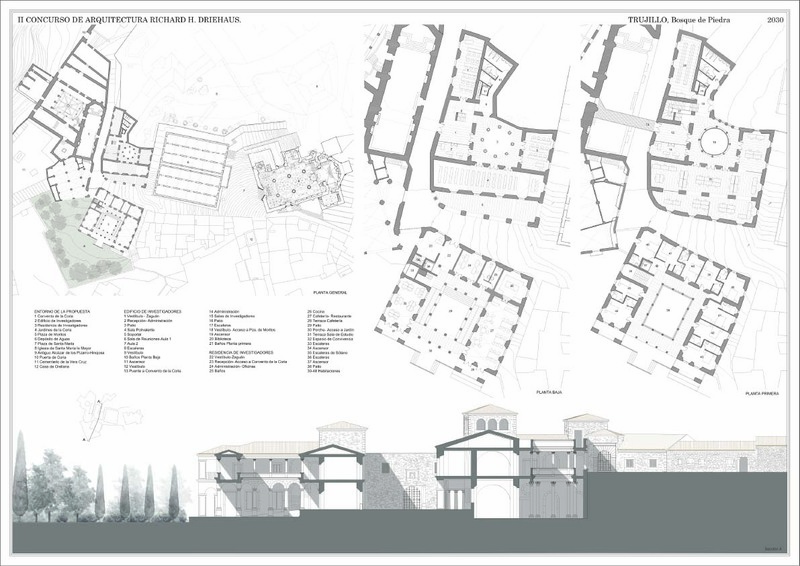 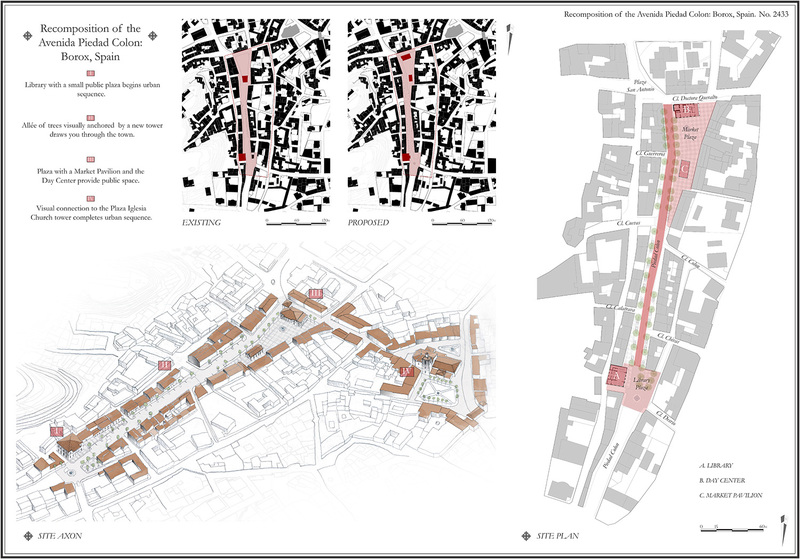 The project takes advantage of the fragmented disposal of the plots to generate diversity by means of different designs for each of the constructions included in the proposal, paying special attention to the facades opening towards the new square, bringing light to the open passages to connect the square to the surrounding streets and creating there new businesses and arcades. 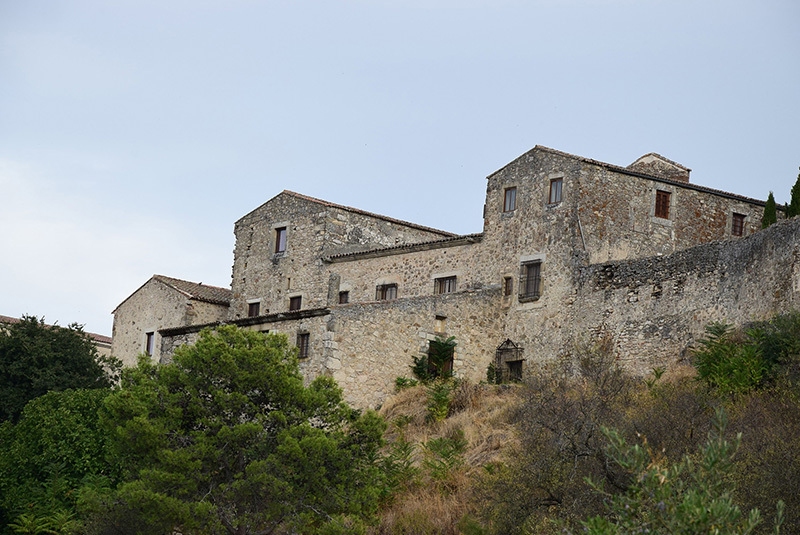 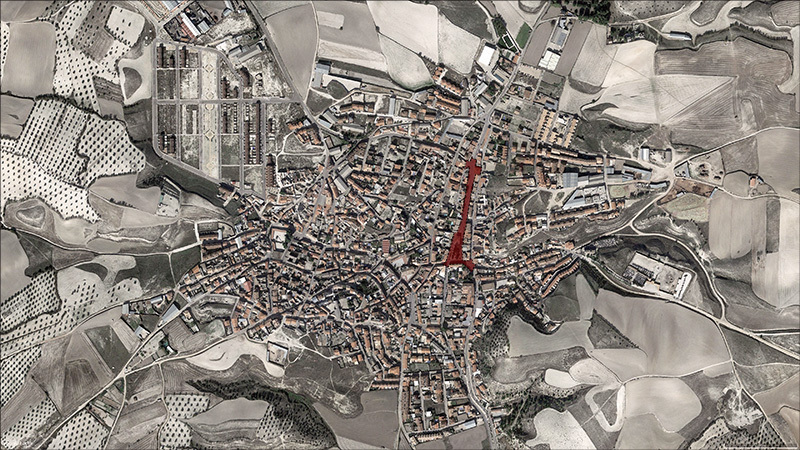 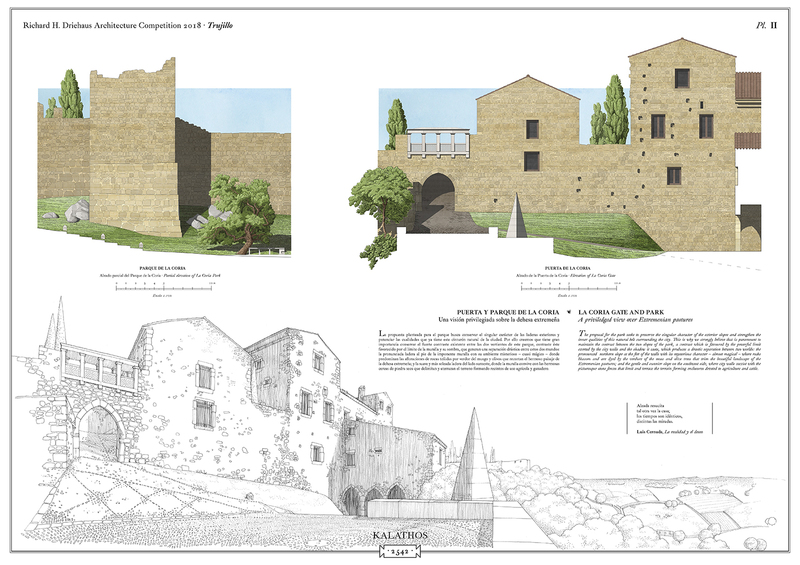 Even though honourable mentions were not contemplated at first for this location – since the design competition was exceptionally reconvened thanks to the help and interest of Jaca’s Town Council itself -, the jury decided to highlight one of the proposals even if it was not awarded with any sort of economic compensation. 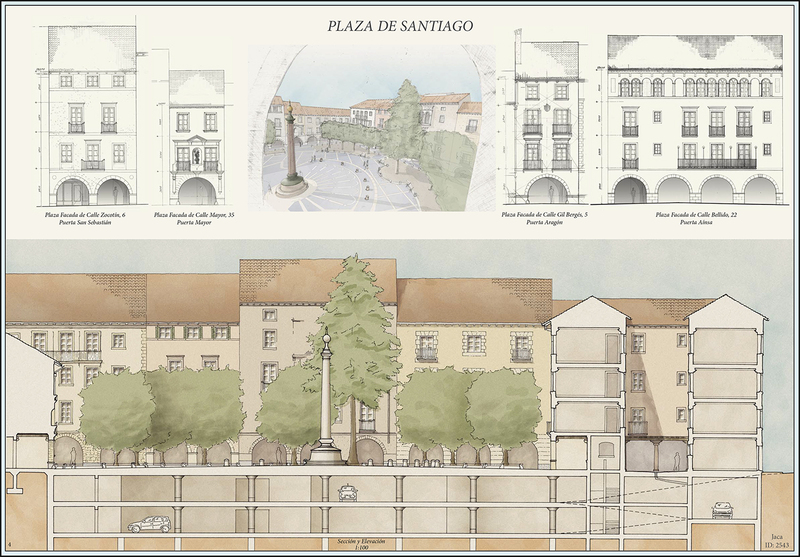 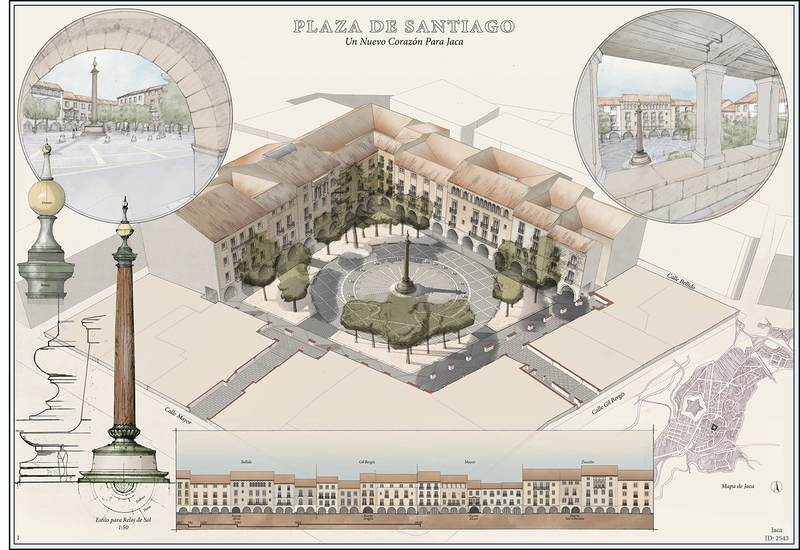 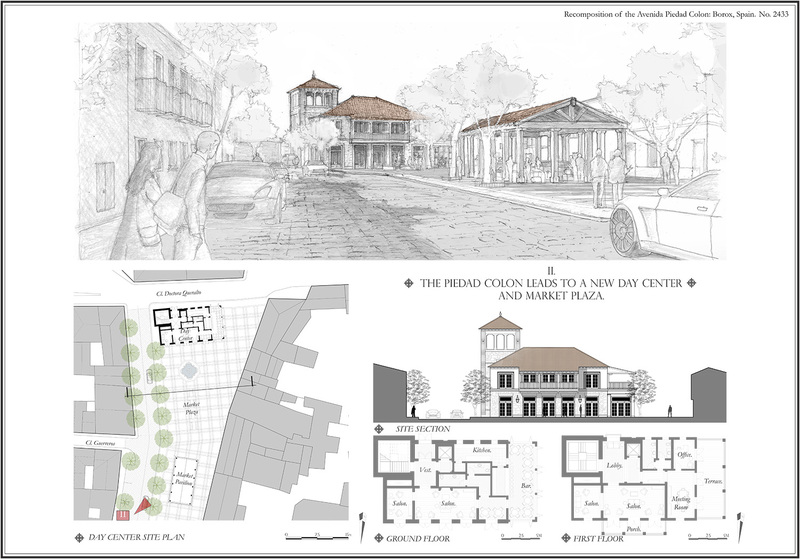 It highlighted the project of the square proposal titled “Plaza de Santiago” which was highly appreciated by the jury and was developed by the architecture studio Fairfax & Sammons Architects. 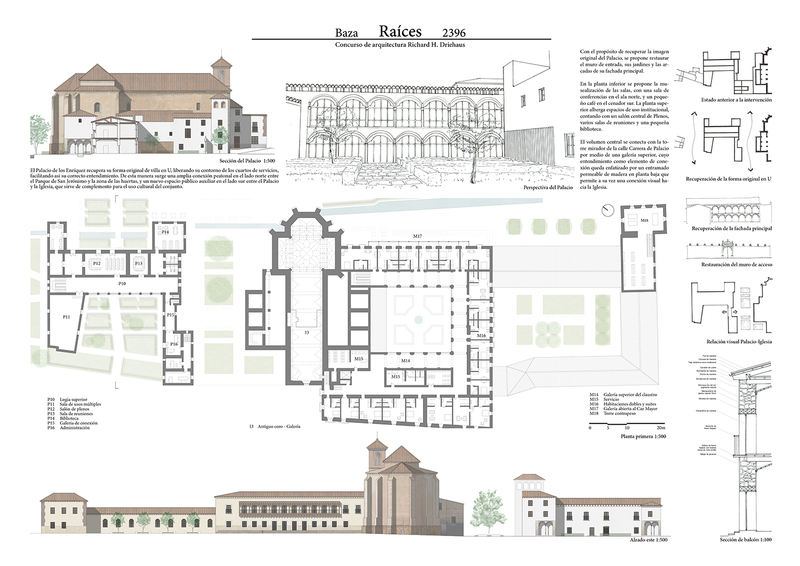 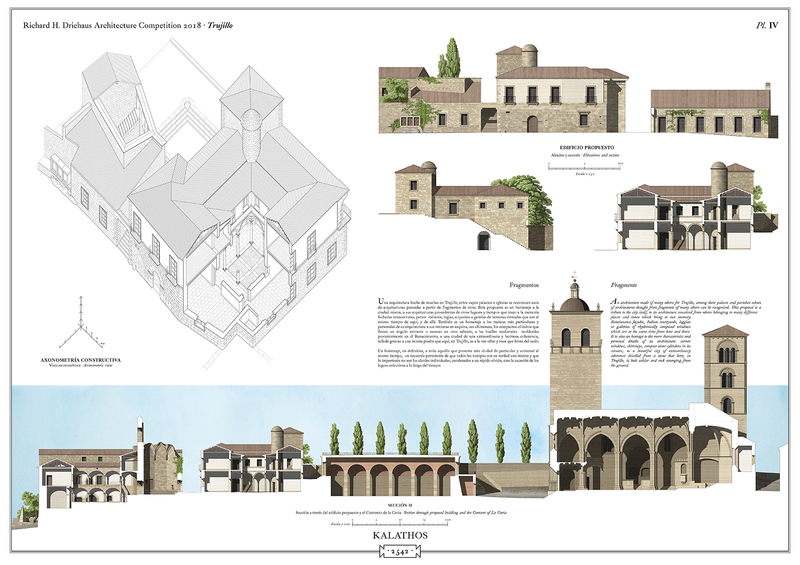 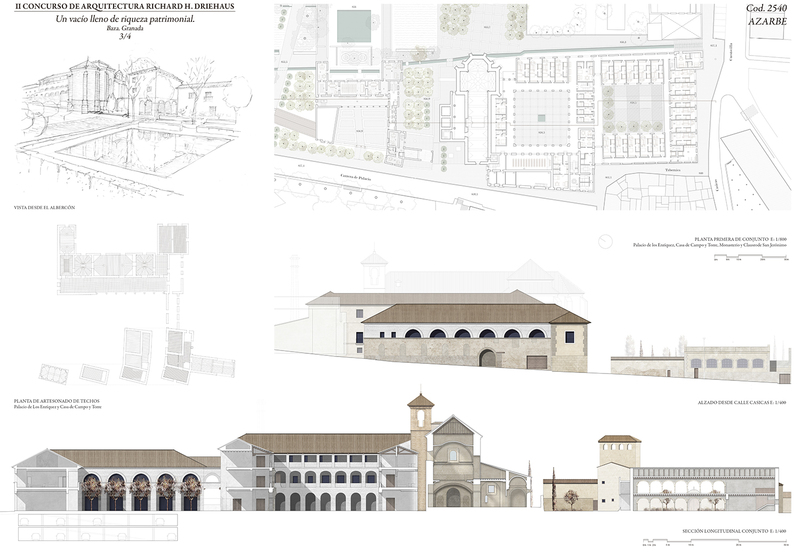 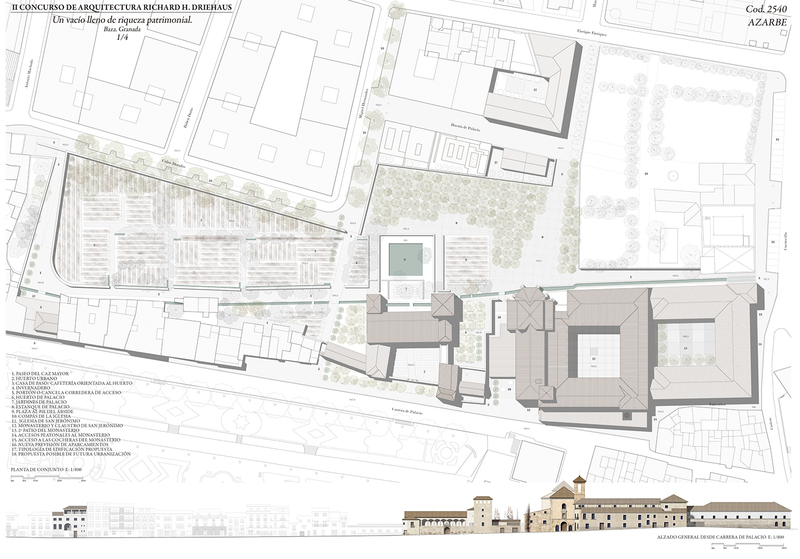 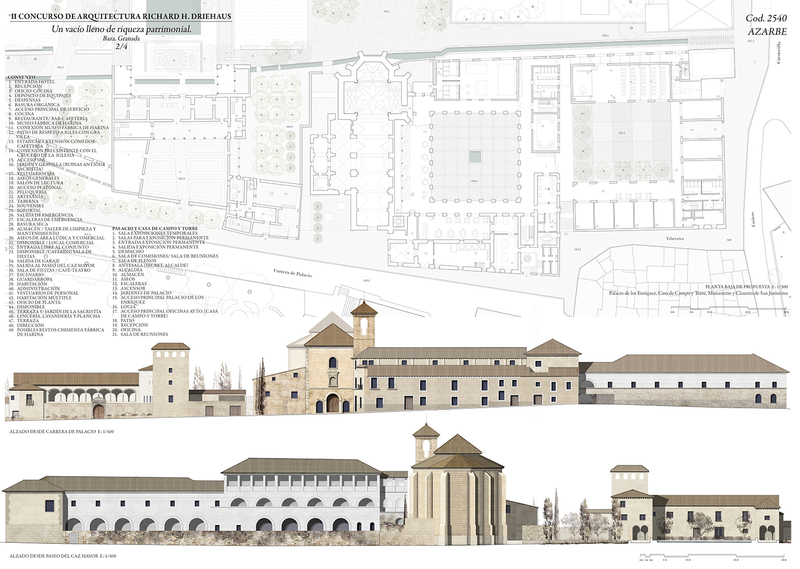 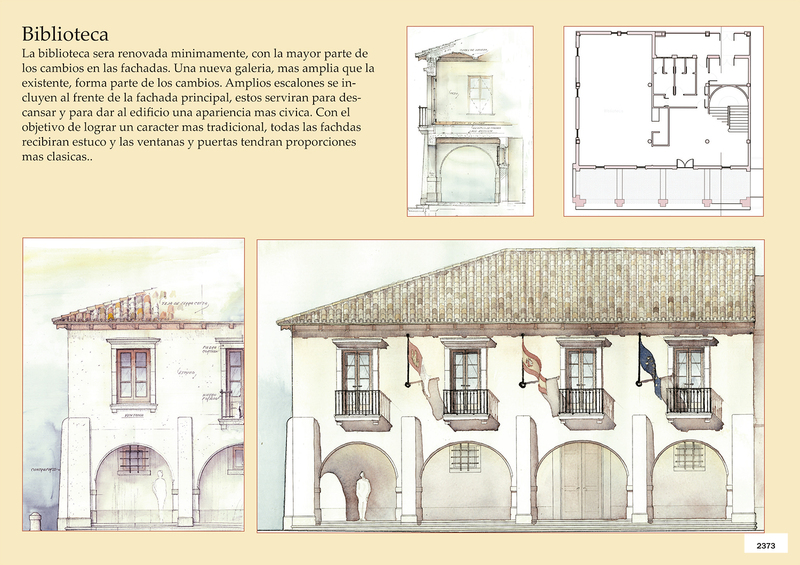 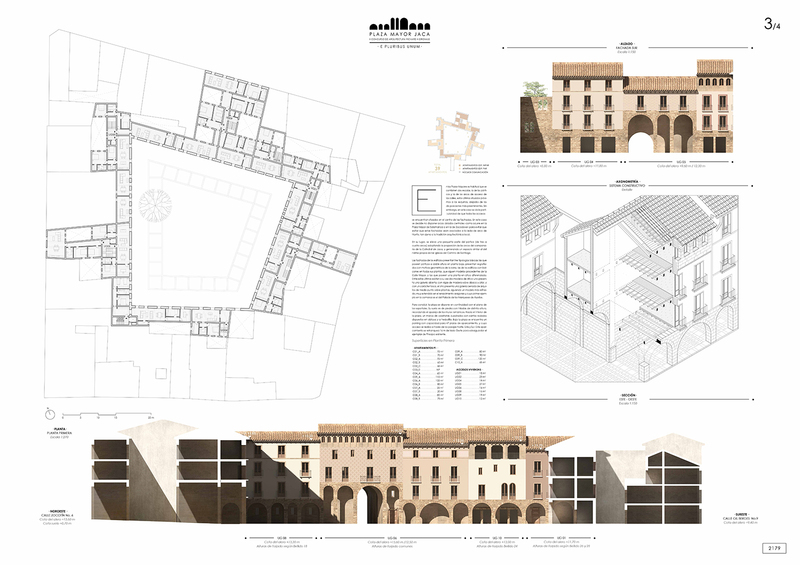 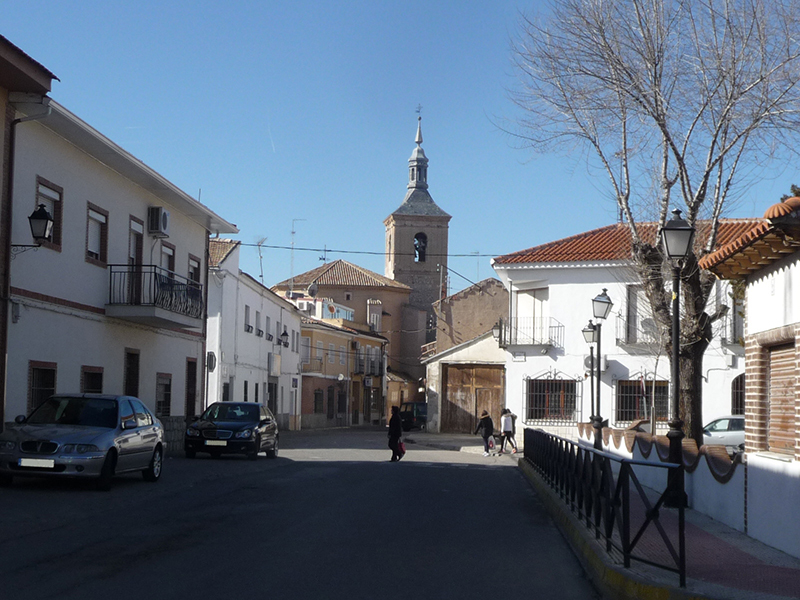 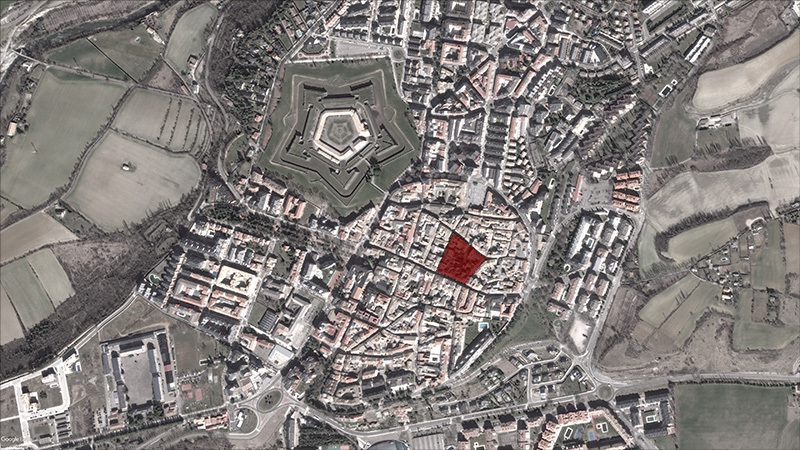 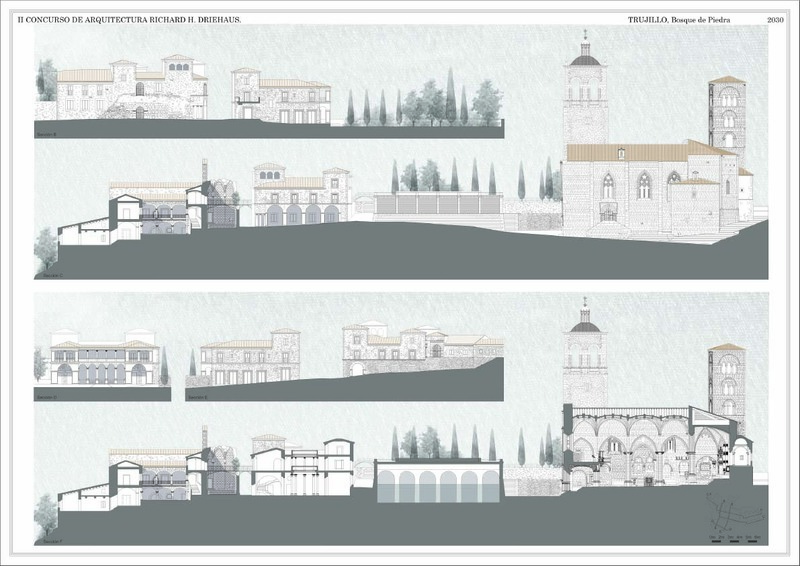 The Trujillo proposal, was a joint initiative of the Town Council and the Xavier de Salas Foundation which aimed to boost and retrieve the value of the urban surroundings of the Convent of La Coria in the North-West area of the historical ensemble, what would also allow it to become part of the touristic and cultural circuits at a local scale. 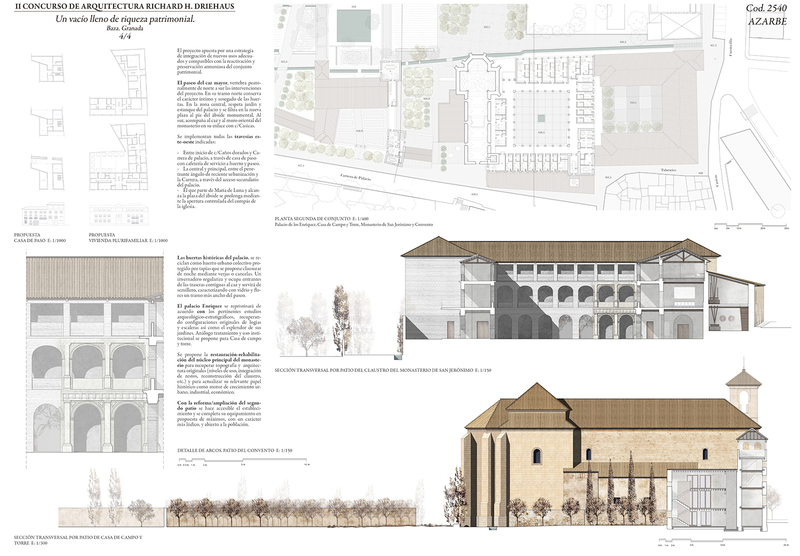 On the one hand, the area included a natural space with great environmental and landscape values outside the walls, where the idea was to carry out an intervention which didn’t alter the silhouette of Trujillo and just made it nicer and more accessible to walk round. 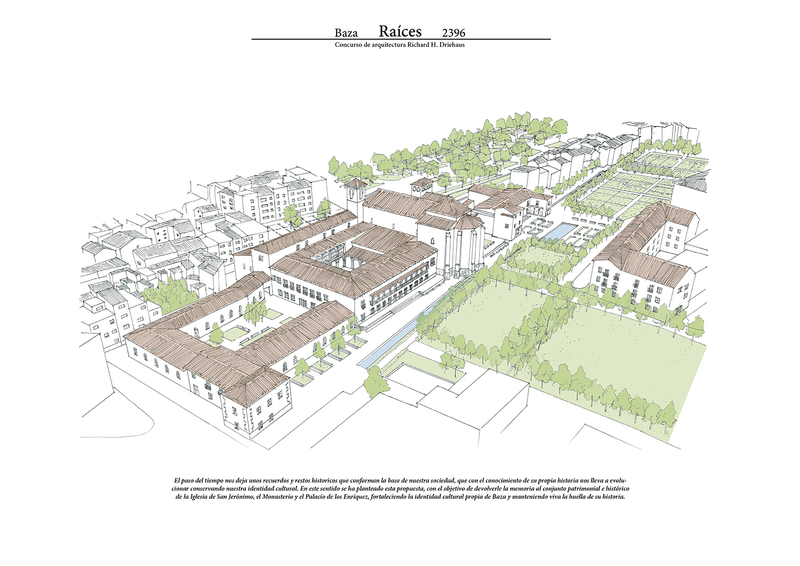 On the other hand, the area surrounding the convent itself, where there are a series of plots of land in ruins: the so-called square named “Plaza de Moritos” -with very little transit today-, the water deposit for the municipality and other public spaces close by basically unused by both neighbours and visitors. 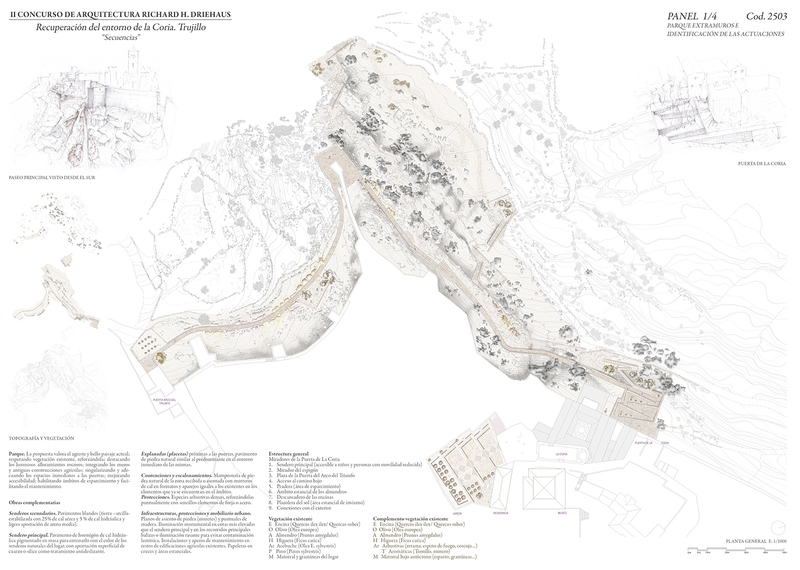 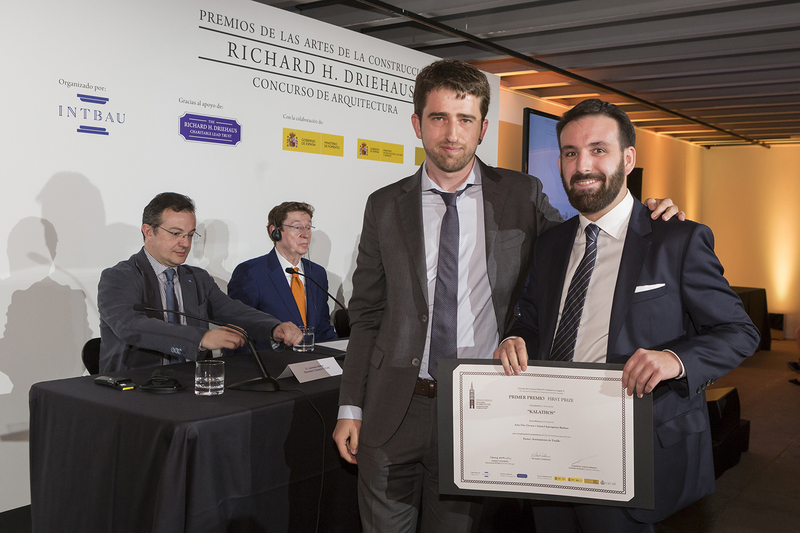 The winning proposal selected by the jury, awarded with 12.000€, was the one under the title “Kalathos”, by the architects from the Basque Country Aritz Diez Oronoz and Imanol Iparraguirre Barbero, who also won the first prize of this competition in the 2016-2017 call with their proposal for Grajal de Campos. 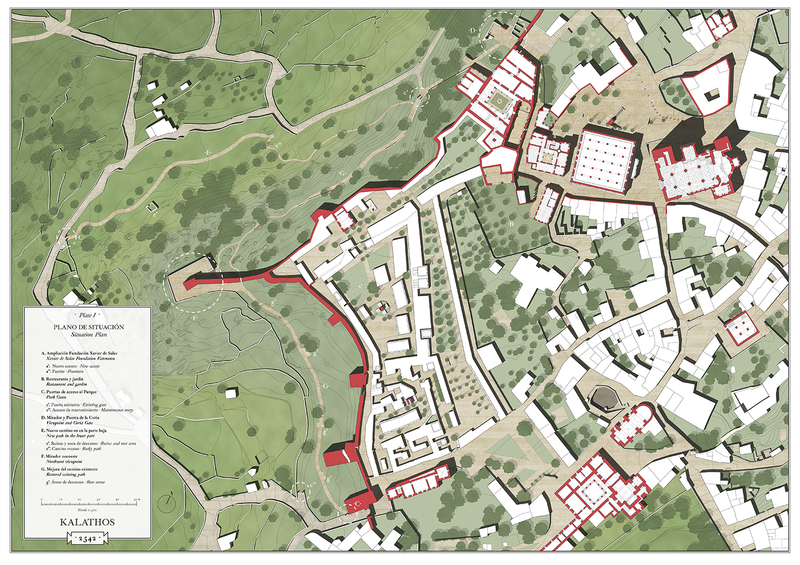 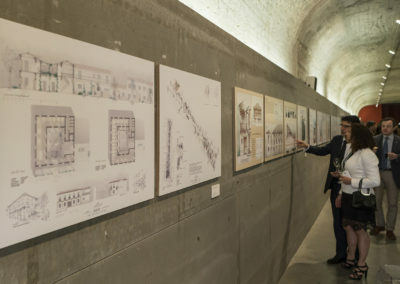 Their project highlights the value of the surroundings of the wall with a series of small interventions aimed at enhancing the values inherent to the place and it suggests the construction of a new building in a ruined area within the city walls. 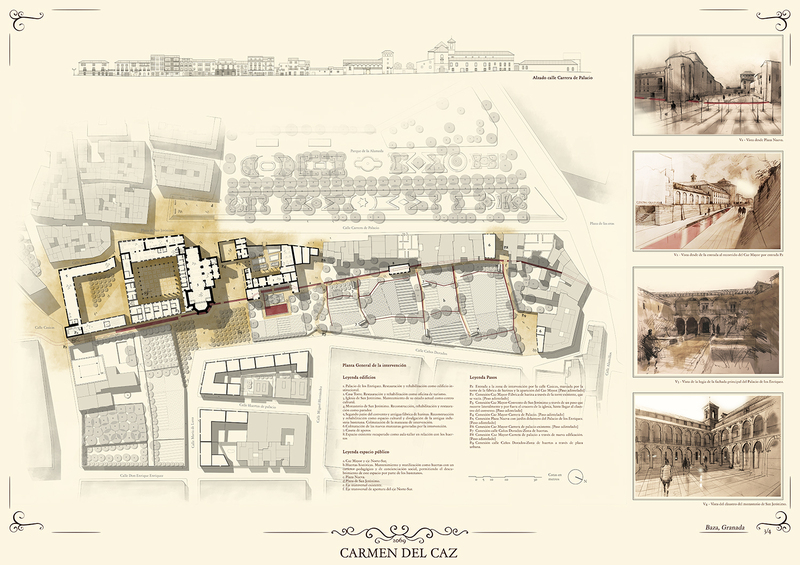 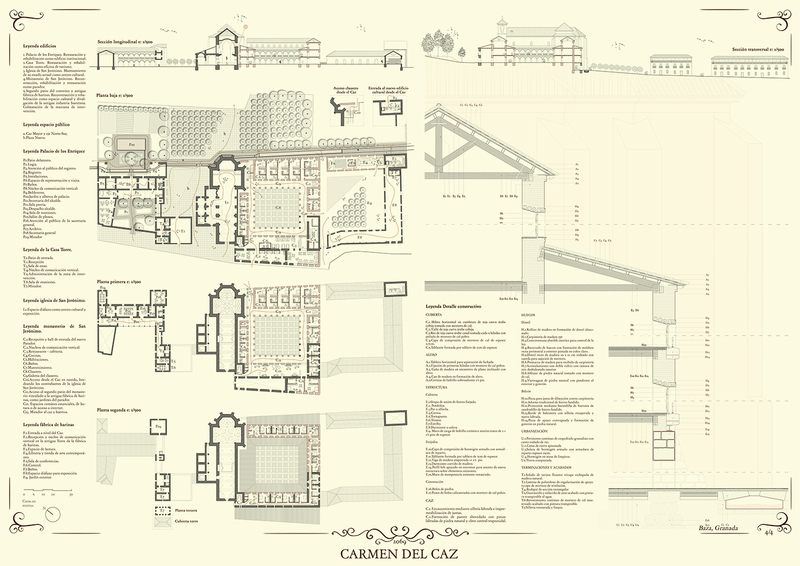 A building designed around a courtyard which brings together the best qualities of the traditional architecture of the place, not only fully-integrating itself in the environment but also enriching it with a building that enhances it and revitalizes it, also connecting by means of a new public access the “Plaza de Moritos” and the Convent of La Coria. 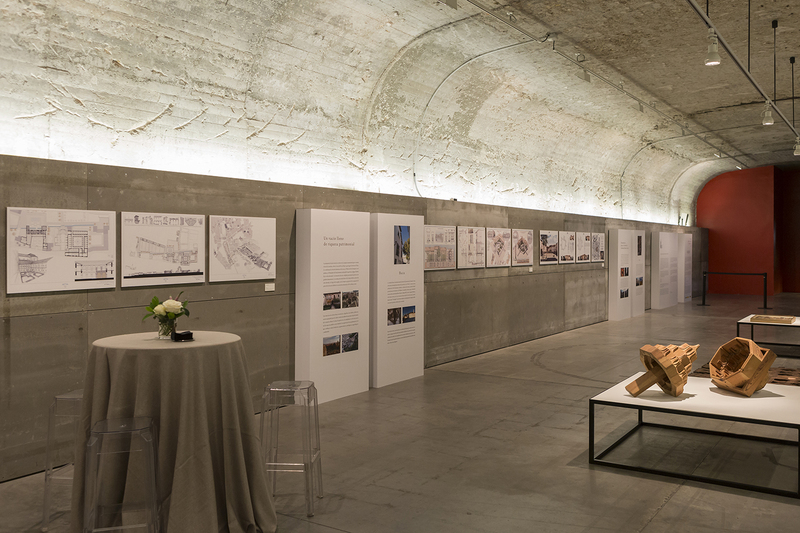 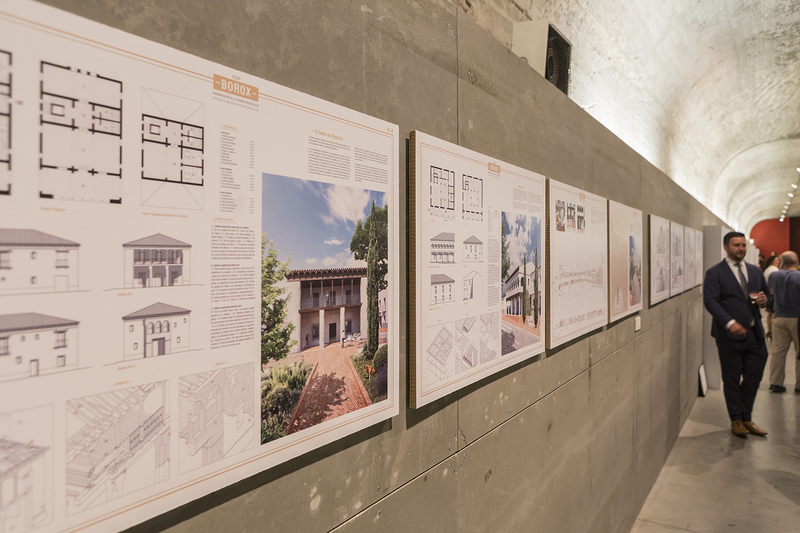 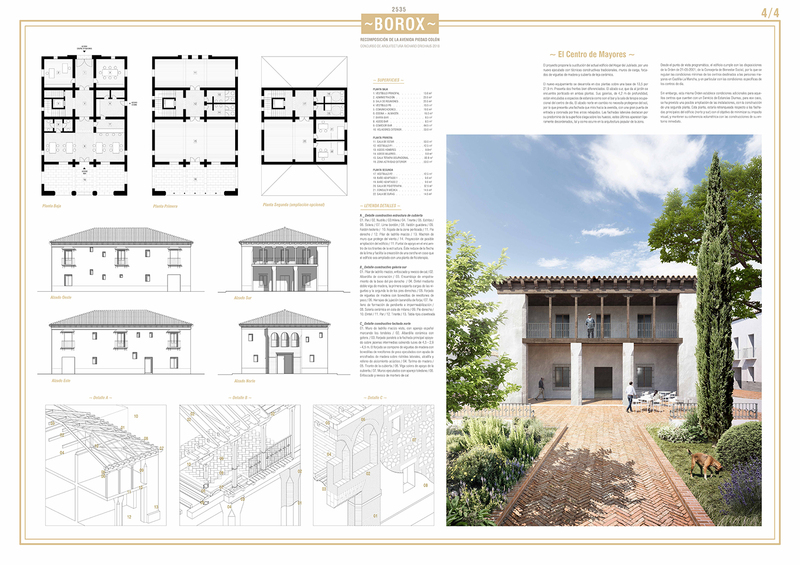 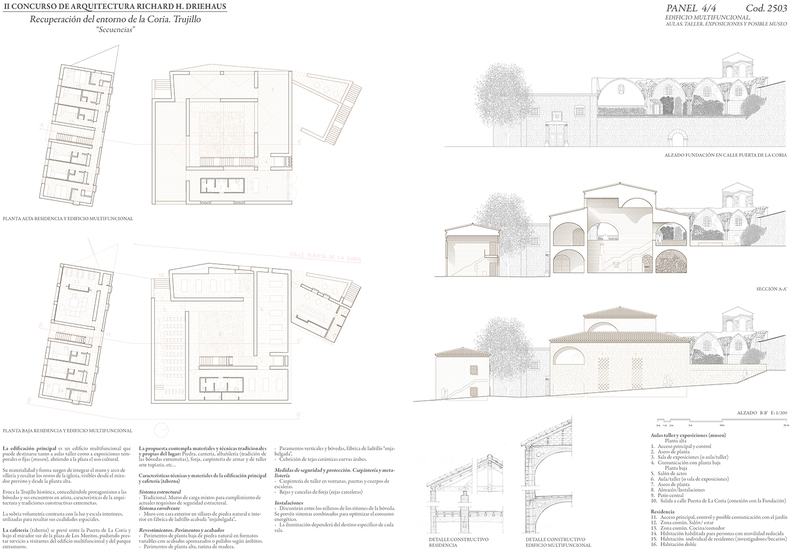 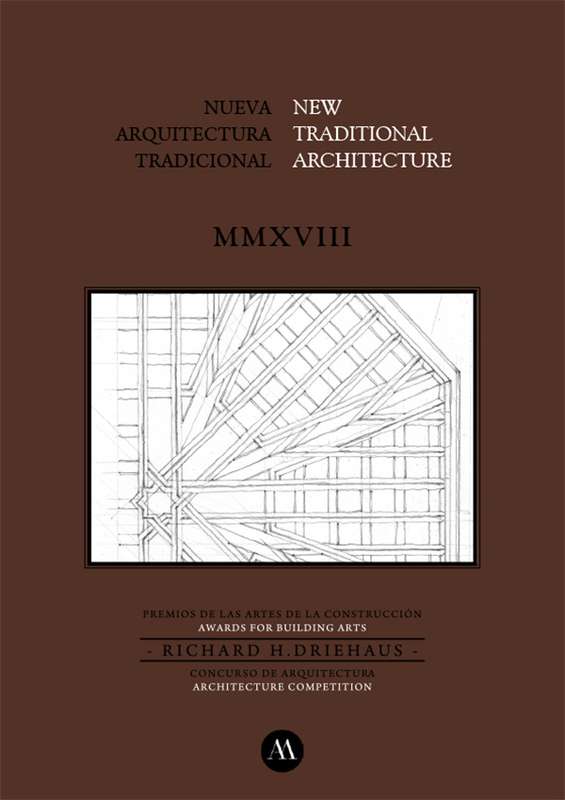 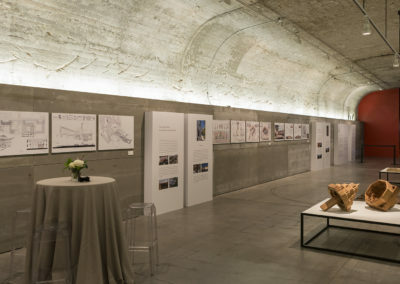 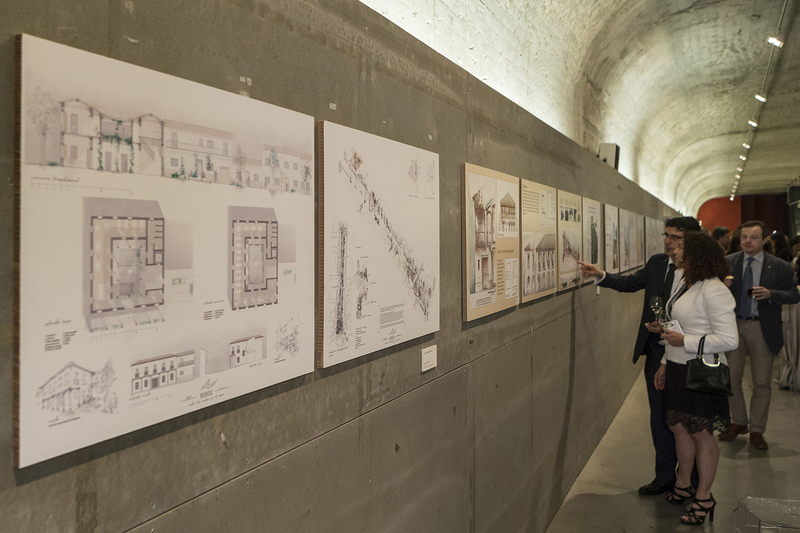 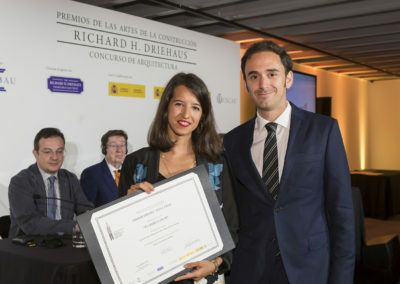 It was published on the occasion of the Richard H. Driehaus Architecture Competition and the Richard H. Driehaus Building Arts Awards 2018 Ceremony, as well as the inauguration of the Traditional New Architecture Exhibition in which were showed the works of the winners in both initiatives from June 13 to July 26, 2018 in the Arquería de los Nuevos Ministerios in Madrid. 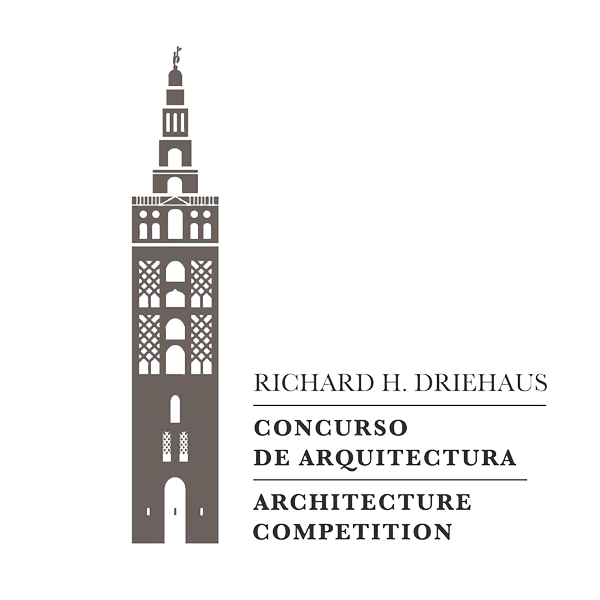 This publication will present the results of the 2018 Richard H. Driehaus Architecture Competition and Richard H. Driehaus Building Arts Awards. 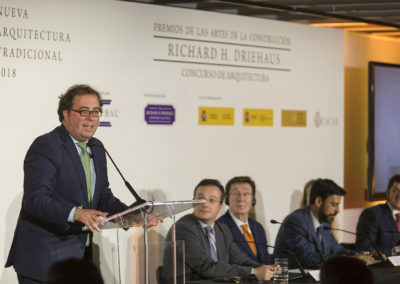 Both competitions are organized by INTBAU (the International Network for Traditional Building, Architecture and Urbanism), thanks to the generous support of the Richard H. Driehaus Charitable Lead Trust, and the collaboration of the Department of Building and Architecture of the Ministry of Public Works and Infrastructure, the Department of Beaux Arts and Cultural Heritage of the Ministry of Culture and Sports, the Rafael Manzano Prize and the Council of Architecture Institutes of Spain. 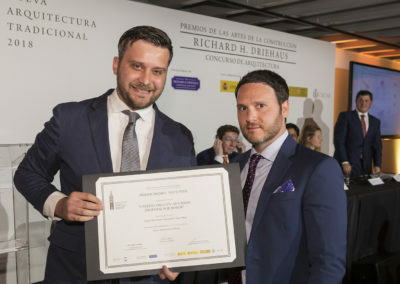 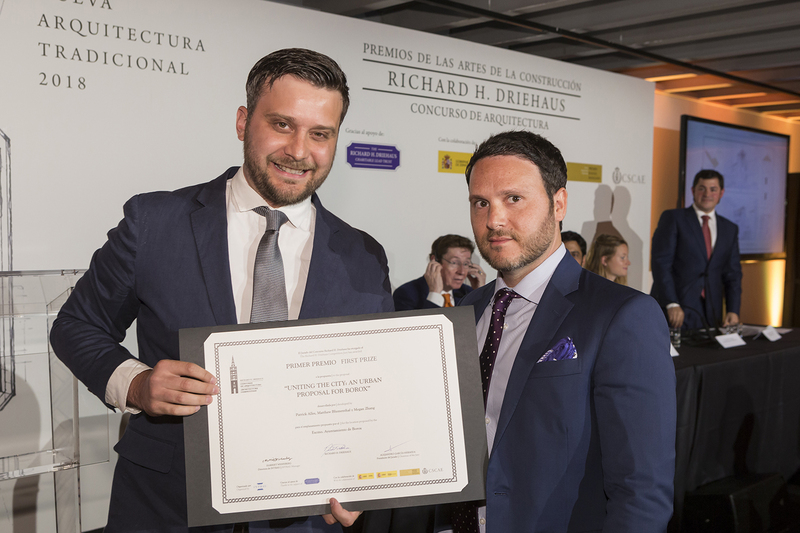 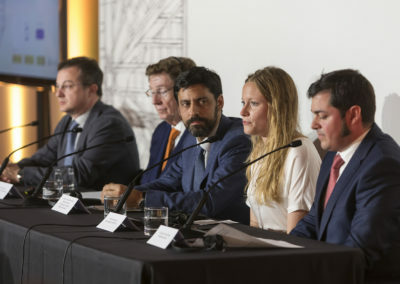 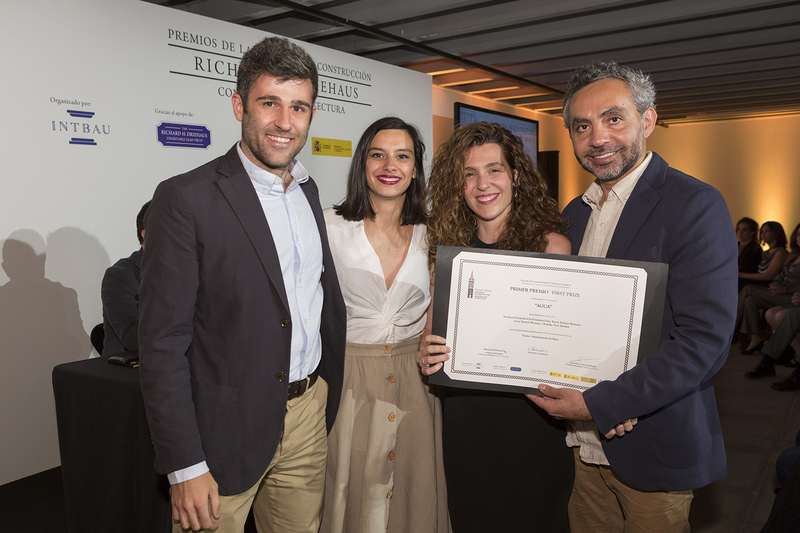 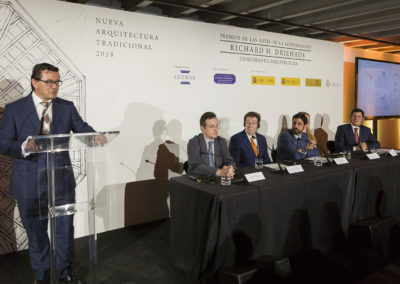 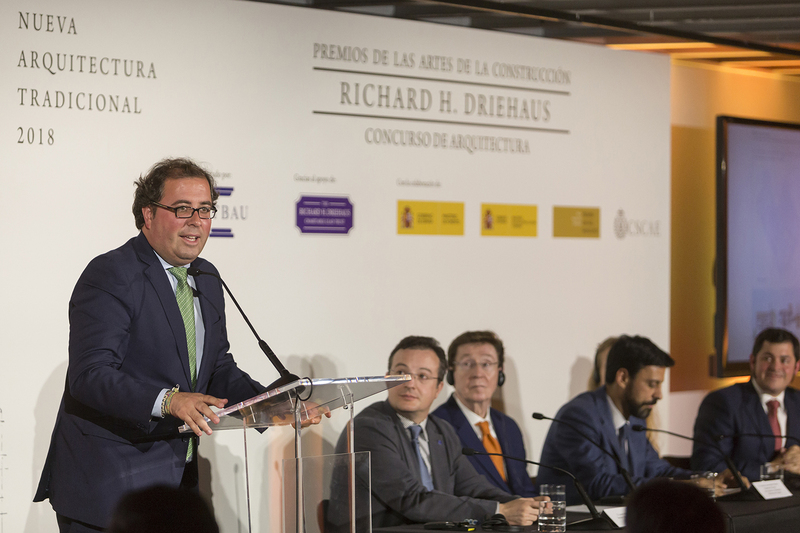 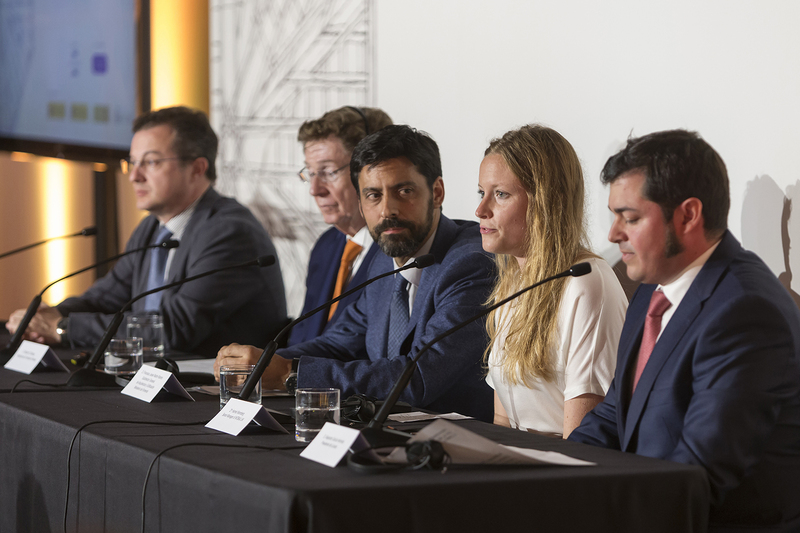 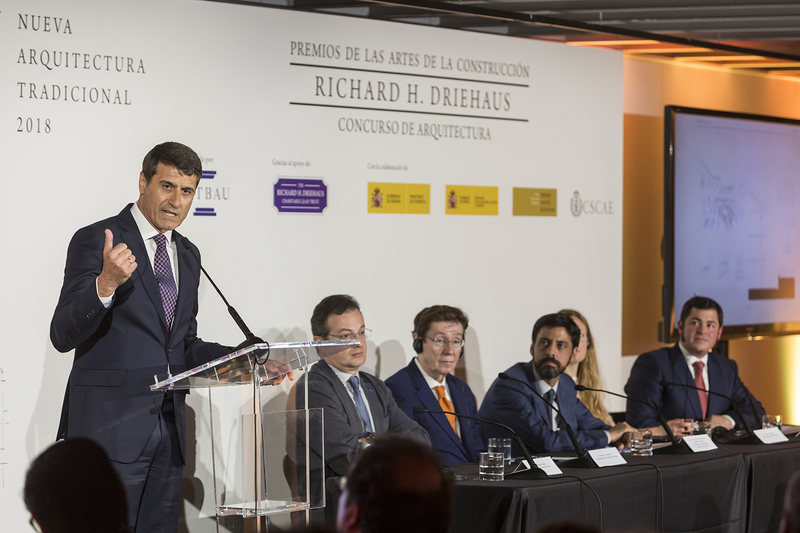 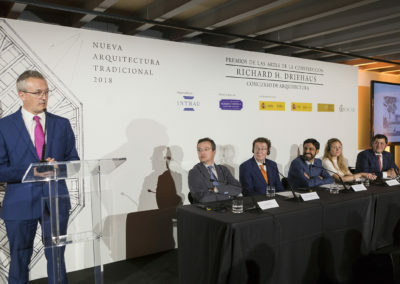 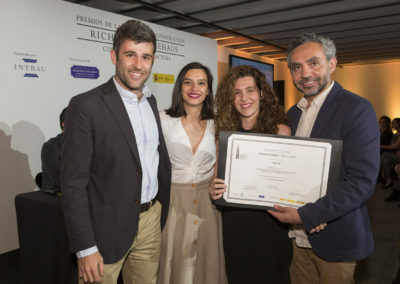 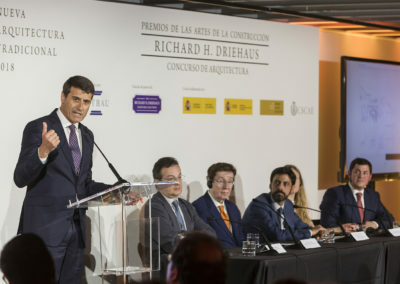 On Wednesday, June 13th 2018, the Richard H. Driehaus Architecture Competition and the Building Arts Awards laureates were presented at the Arquería of Nuevos Ministerios (Madrid). 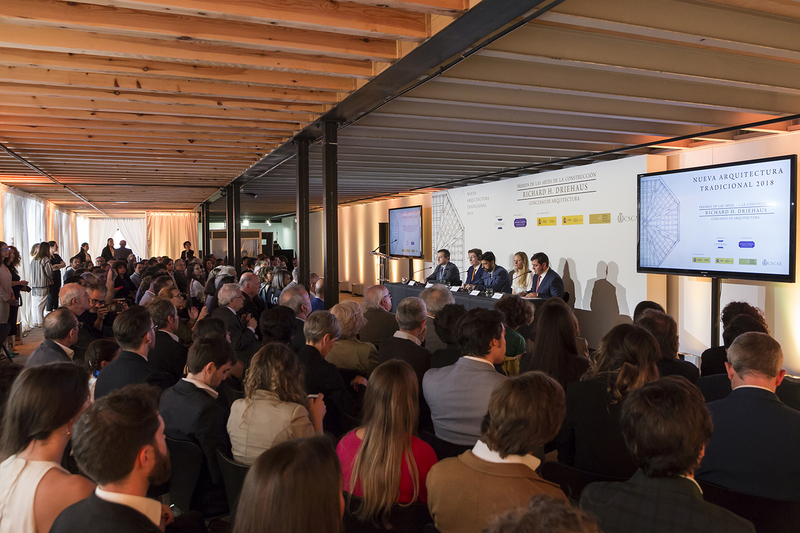 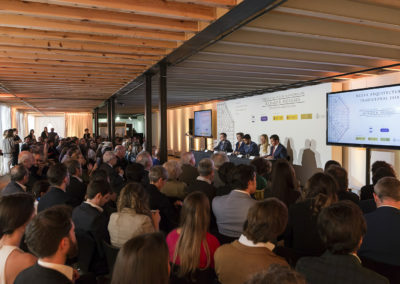 The event was chaired by Francisco Javier Martín Ramiro, Deputy Director of the Ministery of Public Works and Infraestructure, Richard H. Driehaus, Harriet Wennberg, INTBAU Senior Manager, Laureano Matas, Secretary of the Council of Architecture Institutes of Spain and Alejandro García Hermida, coordinator and chairman of the jury of the both initiatives . In the same venue it was inaugurated the exhibition “New Traditional Architecture 2018” showing the works of the winners until July 26th. 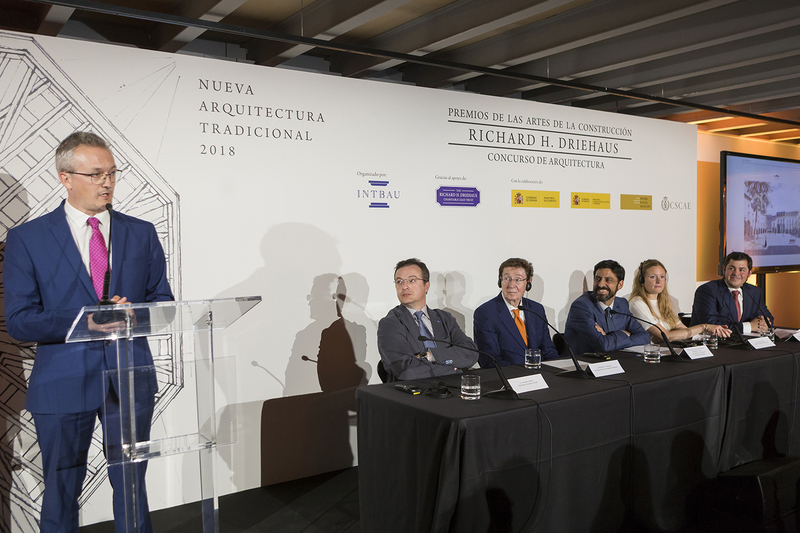 The authors of the awarded projects on the first edition of the Richard H. Driehaus Architecture Competition, presented their proposals during the Architecture and Place Making international Seminar, hold in the Universidad Politécnica de Madrid School of Architecture (ETSAM) on November 7th – 8th, 2017. 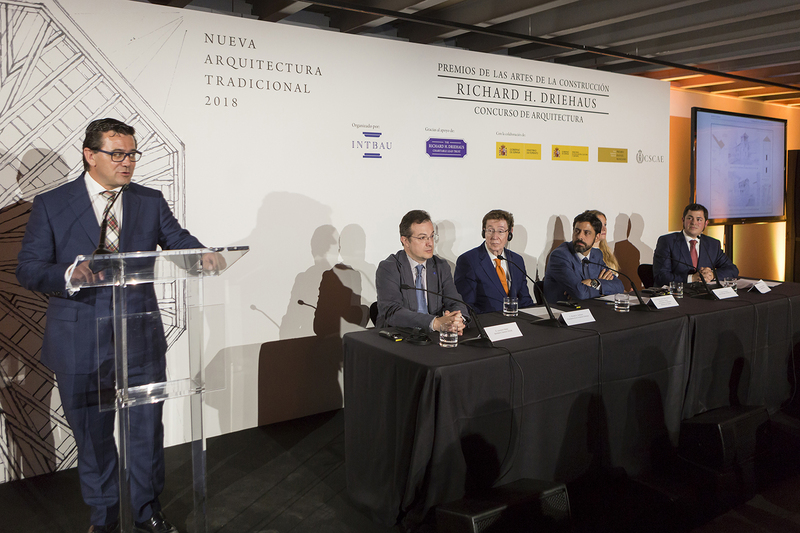 This Seminar is organized by INTBAU (International Network for Traditional Building, Architecture and Urbanism) and the Rafael Manzano Prize of New Traditional Architecture, thanks to the support of The Richard H. Driehaus Charitable Lead Trust, through a grant from The Chicago Community Trust, with the collaboration of the Universidad Politécnica de Madrid, the Universidad Alfonso X el Sabio, the Escola Superior Gallaecia, the Fundação Serra Henriques and the Centro de Investigación de Arquitectura Tradicional (CIAT).